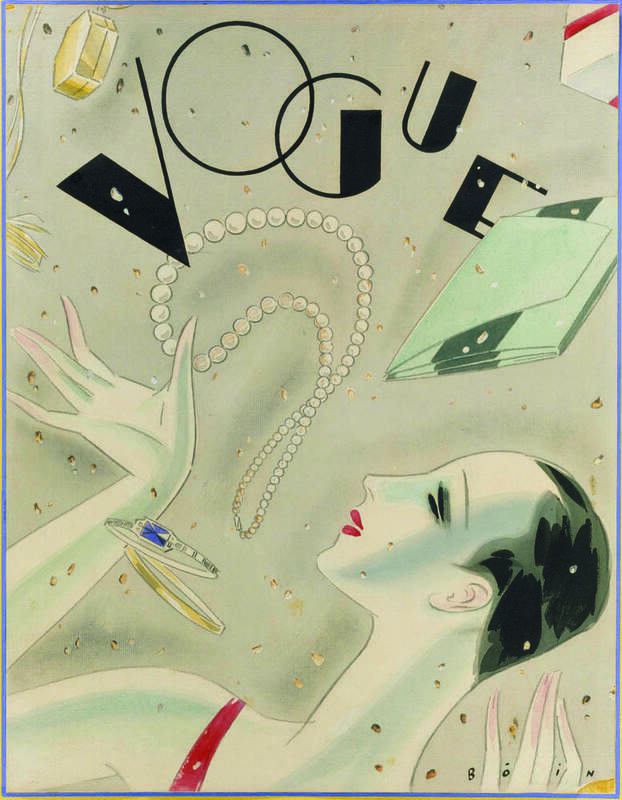 Audrey Hepburn having Breakfast at Tiffany’s, Johannes Vermeer’s wan-faced Girl with a Pearl Earring, F Scott Fitzgerald’s jazz-age novella The Diamond as Big as the Ritz: art has a fast reputation for plundering the jewel box. And why not? 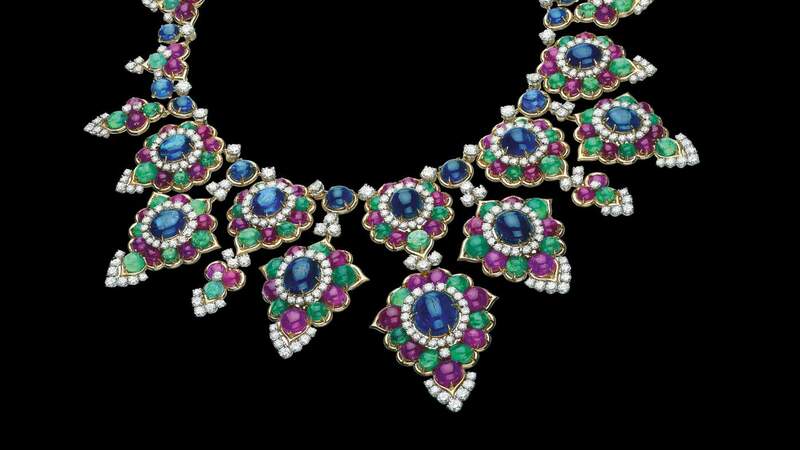 What could be more evocative or enticing than a gobstopper-sized gemstone – especially when found on an exotic neck. 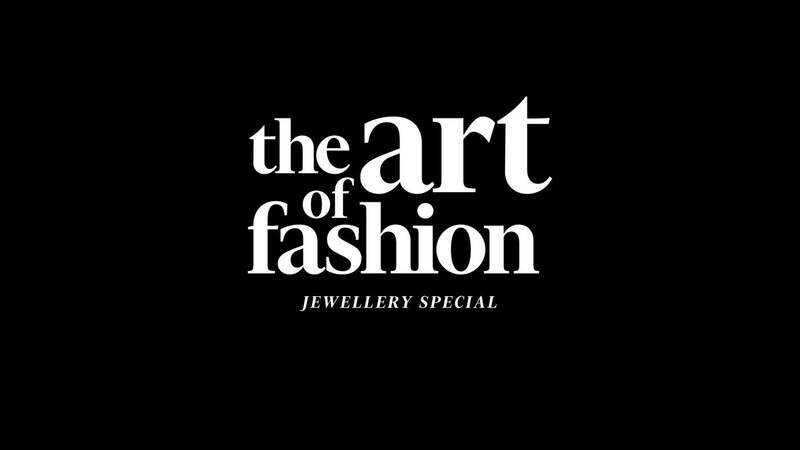 Jewellery is the star of the Art of Fashion’s third issue – a tribute to the Croisette at Cannes, where film and fine jewellery are once again coming together at the most glamorous of film festivals, and the artisans and craftsmen who make them. Writer Chloe Fox explores the magical power of the pearl, nature’s most alluring mystery, while Vivienne Becker takes the tiara on a cultural trip, from the court of Empress Joséphine deep into the Forbidden City. Jewellers, an exotic breed of their own, occupy a vaulted position in the luxury world, a realm where expense and execution are only hampered by the limits of their own creativity. But what inspires them? 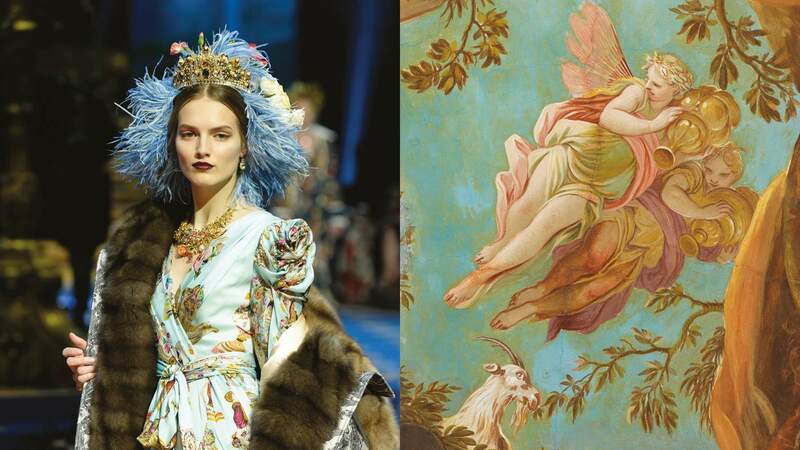 Victoire de Castellane, Domenico Dolce and Stefano Gabbana and Gaia Repossi all talk about works that have sparked their dazzling creations. Shiny happy people? You bet they are. Today, de Castellane is in her studio, a pale grey apartment near Dior’s headquarters on avenue Montaigne in her home town of Paris. She is surrounded by shelves of art books, boards of references and pots of felt pens. The pens are a familiar feature of her artist kit: the tools she uses to depict herself ­– a long black silhouette with heavy blonde fringe – alongside Monsieur Dior, in sparkly animations in which the two voyage time and space on bejewelled adventures. 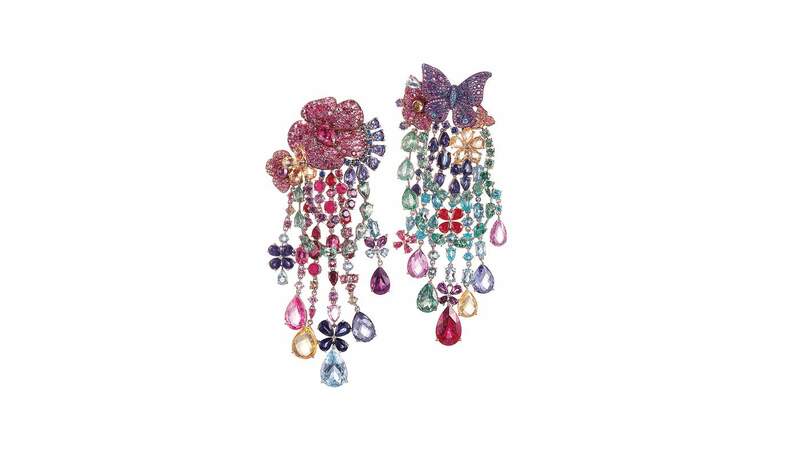 De Castellane’s jewels are an especially pretty study in escapism, and she puts play before all other preparation when it comes to work. 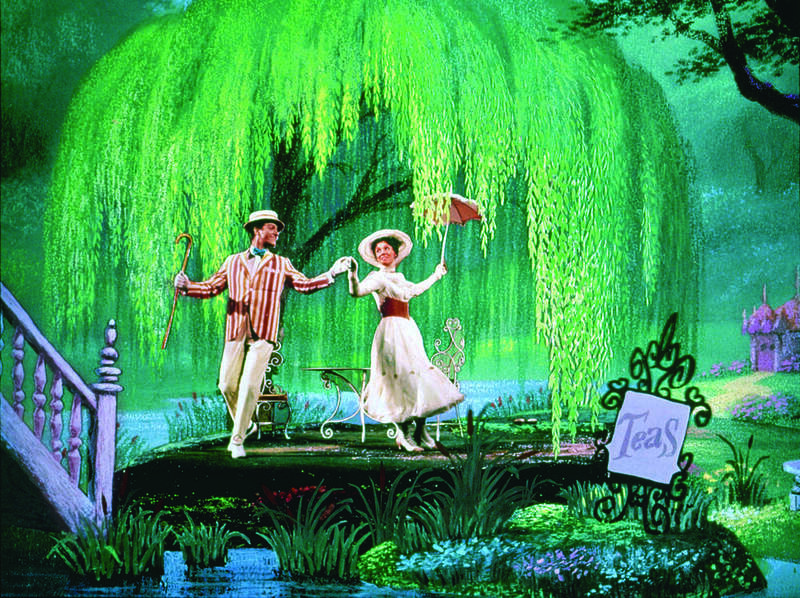 Her design owes much to the rich screen world she fell in love with, in particular the lush Technicolor of musicals like An American in Paris and Mary Poppins. “I was obsessed with Hollywood, all the Gene Kelly movies, Liza Minnelli, Marilyn Monroe,” she says of her cinematic inspirations. 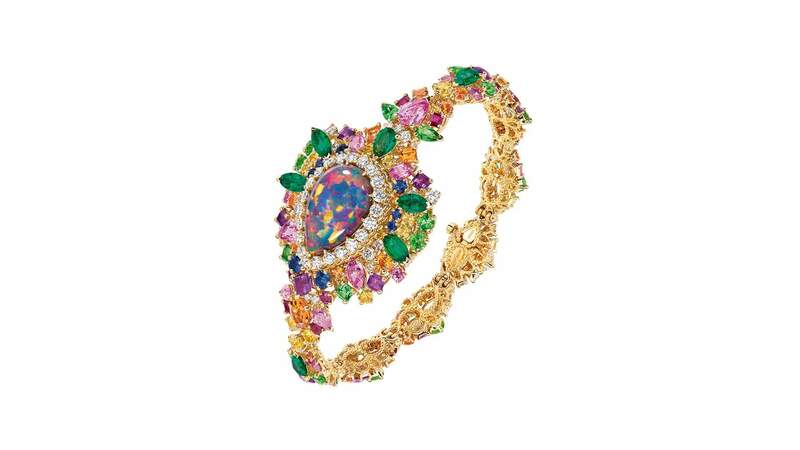 De Castellane still adores a fairytale, but now prefers to tell her stories with gemstones and precious metals. And while she takes inspirations from diverse subjects – a dancer’s ribbons, an artwork, the line of a chair leg – her ultra-feminine designs are guided by the same primal emotions she got from her cinematic favourites. 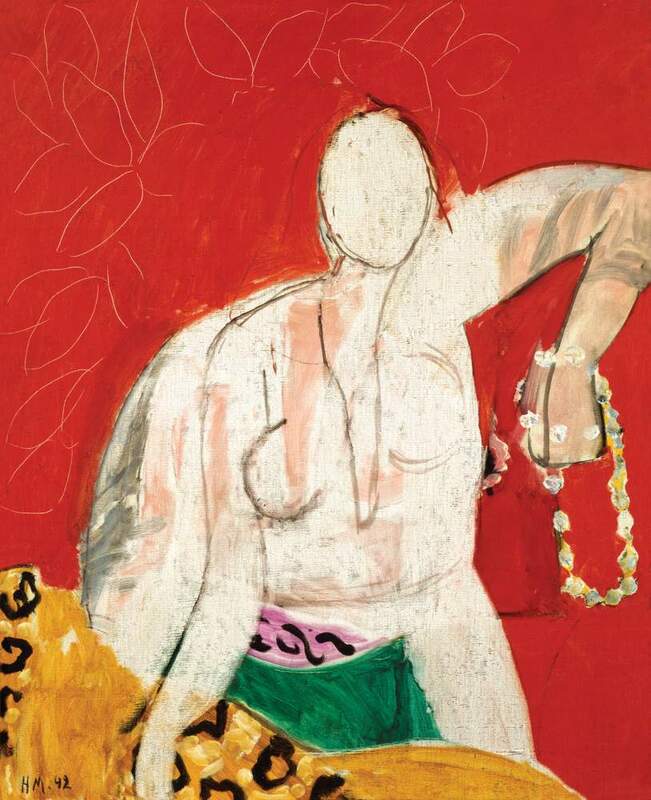 She admires Picasso because his work epitomises the child-like attitude she tries to find in the studio. 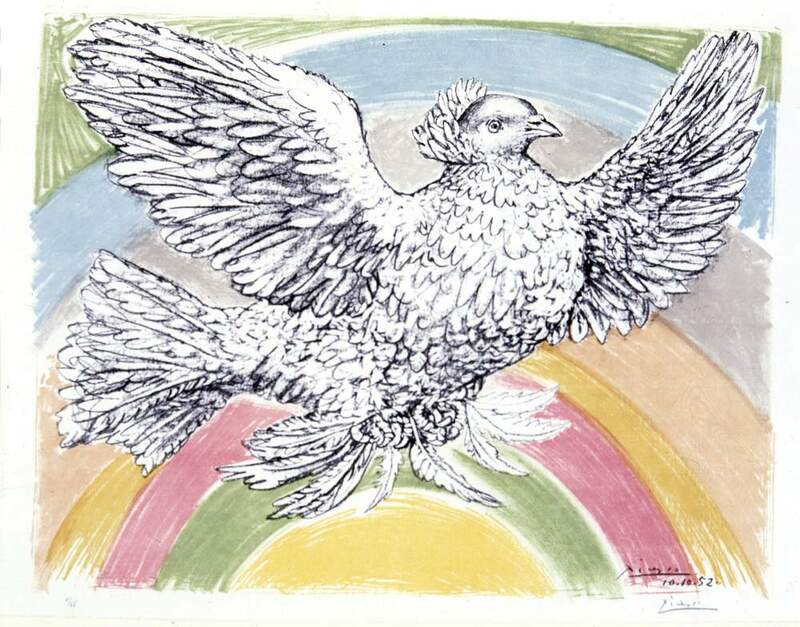 “That’s why it’s so charming because it’s absolutely free,” she says of Picasso’s animal sketches, mere strokes of ink that suggest each creature’s contours. The final pieces included black silver, oxidised silver and pink gold settings, with stones cut to represent the different eras. 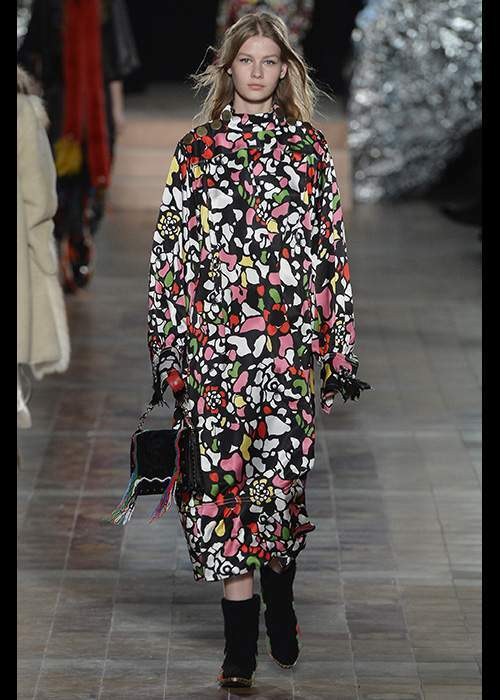 But the mood of the collection was romantic. “An atmosphere can be the start of the inspiration. I can start with a world,” she says. For the Versailles collection, that world was candlelit. 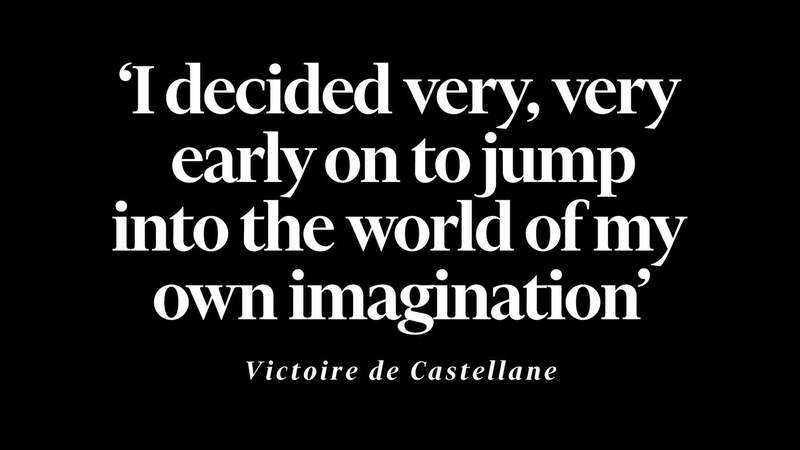 For de Castellane, the thrill in creating jewellery is in its longevity. “Jewels carry eternity,” she says. “I love the idea something that has been worn on your skin might transfer to whoever wears it next. There’s a magic in it.” And truly there is a sort of sorcery in how she breathes life into her stones. Like her heroine, Mary Blair, she has a rare skill for finding personality in the inanimate. 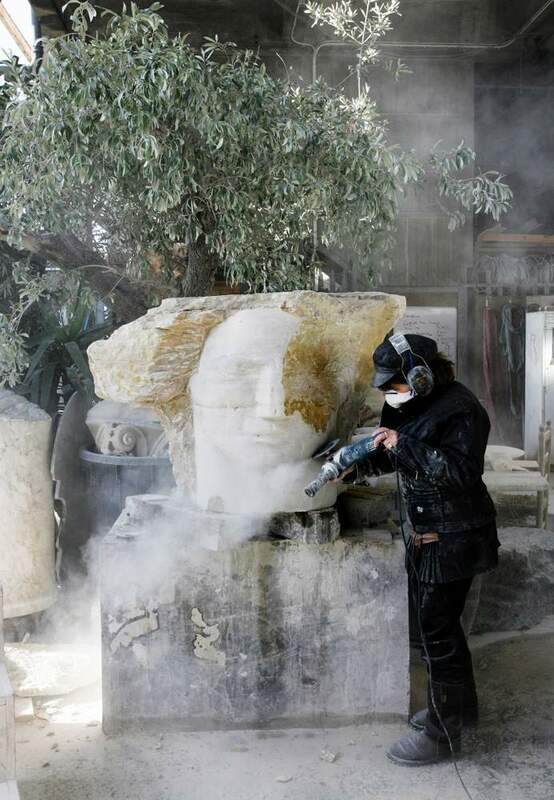 It is teasing out the personalities of the stones and creating narratives for them that work is about for de Castellane. “It’s like a little story,” she says. In her own collections these stories are bigger, wilder and sometimes quite ferocious. 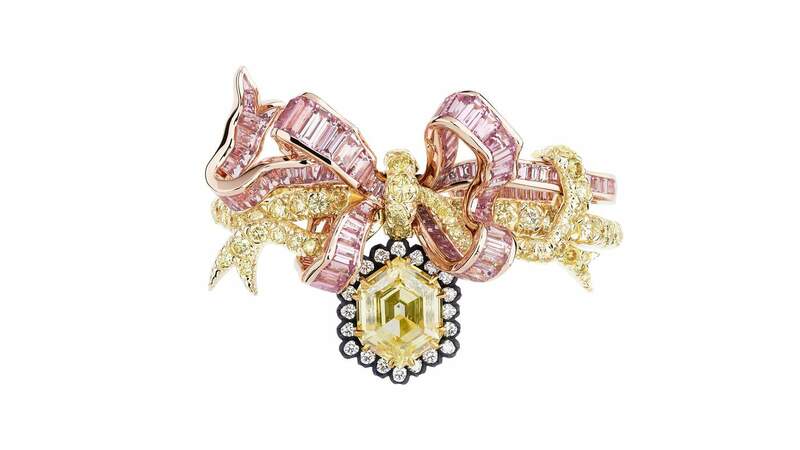 For Dior, they are gentler. 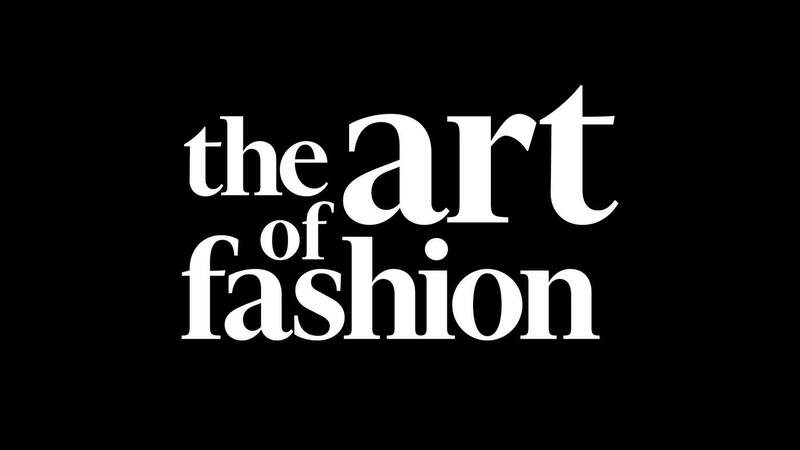 “I like the idea of a very naïve world,” she says of her work for the house, “where the world is beautiful, everything is OK, there is no war, people never have illnesses, and everybody can eat what they want.” It’s also a chance for her to loosen up the “sometime serious” reputation of Christian Dior, and “make him a little more punk”. 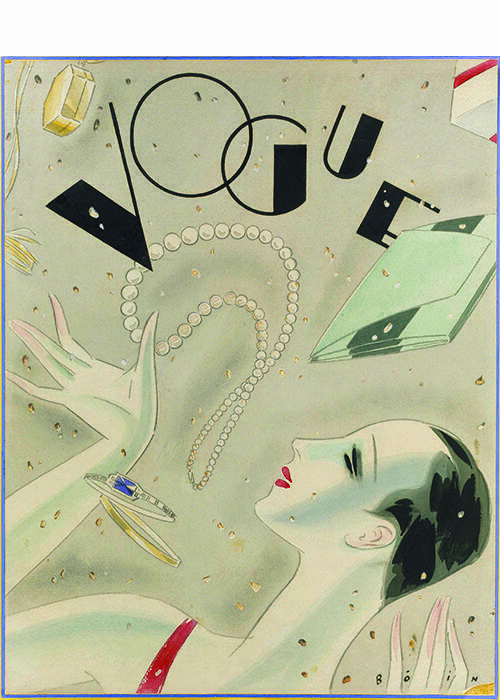 Sketch by Victoire de Castellane of herself with Monsieur Dior. Fashion has long been in thrall of artist jewellery. 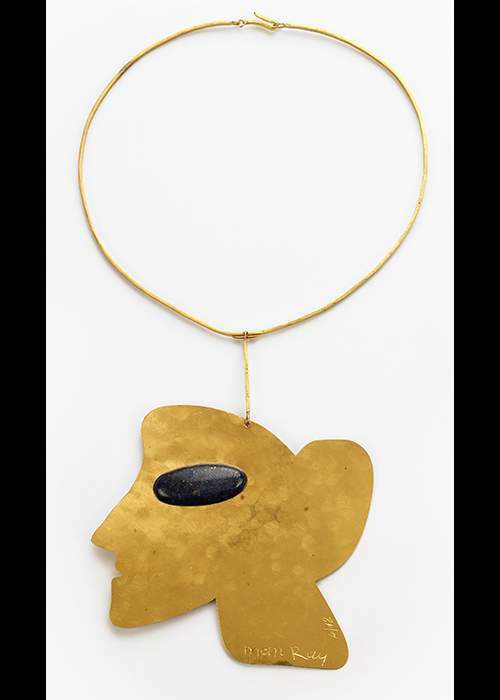 In the 1930s, couturier Elsa Schiaparelli commissioned her circle of artist friends including Jean Cocteau and Alberto Giacometti to create experimental jewels for her collections; art world fashion plate Peggy Guggenheim boasted of being the only woman to wear the “enormous mobile earrings” conceived by kinetic artist Alexander Calder; and Yves Saint Laurent, a generous patron of the French husband-and-wife artist duo “Les Lalannes” summoned Claude Lalanne to conjure a series of bronze breast plates, akin to armour, for his dramatic autumn/winter 1969 show. 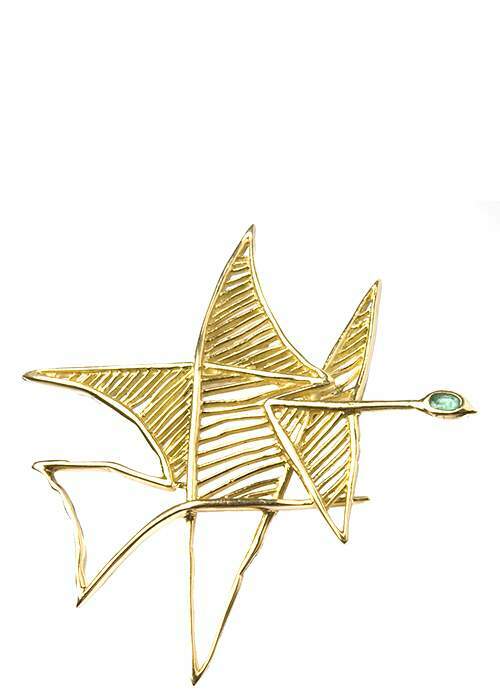 But why has artist jewellery been overlooked for so long? 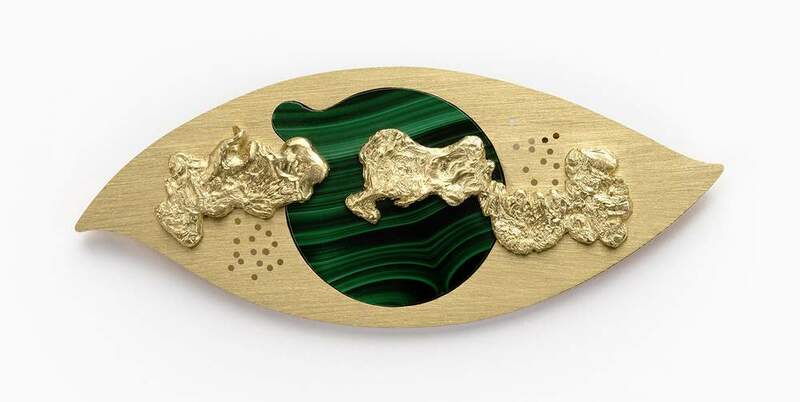 The simple fact is that many people have no idea that artists as varied as Picasso, Man Ray and Max Ernst ever made jewels. 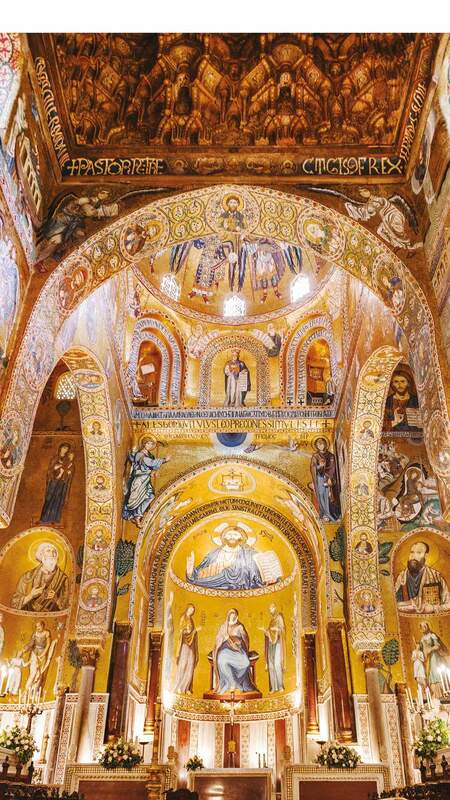 Created sporadically, often in small batches, their works are incredibly rare. But with more art fairs and shows than ever, the pool of collectors is gradually growing – and with it the prices. 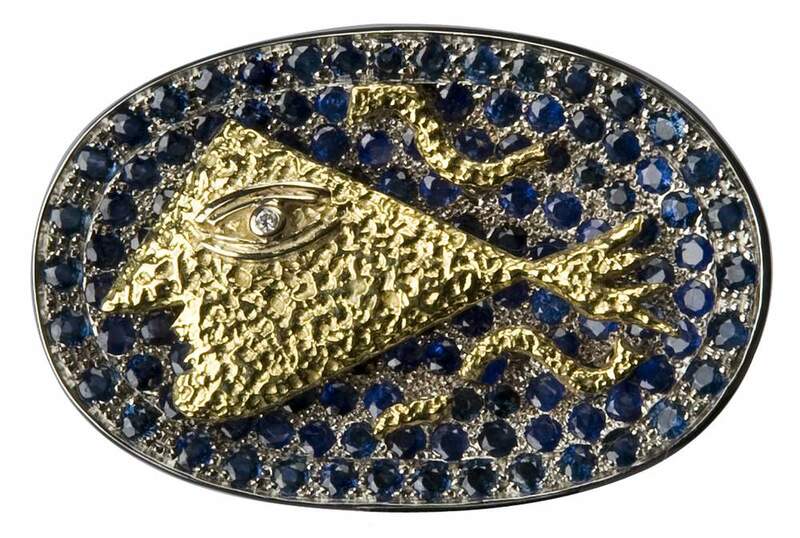 A few years ago, a brooch by Salvador Dali, “The Eye of Time” sold in London for around £75k, before being re-auctioned months later in Manhattan for approaching £1m. 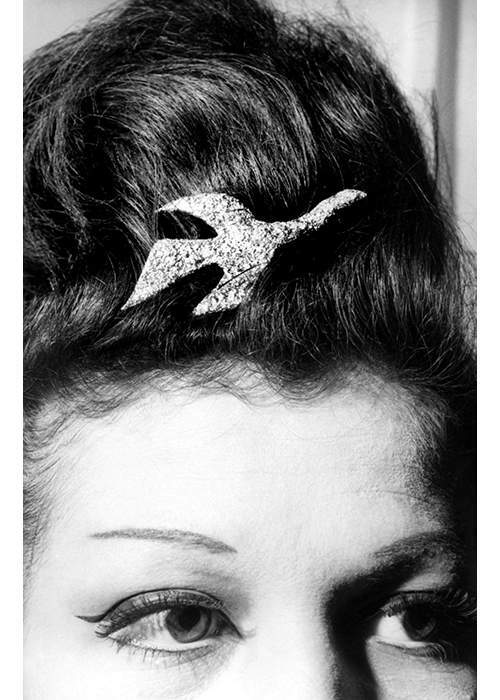 A brooch portraying Lee Miller’s lips, rings complete with tiny tunnels that offer an alternative perspective on the world and 24 carat gold sunglasses – it’s no surprise that the avant-garde artist Man Ray’s forays into jewellery were short on practicality but big on invention. 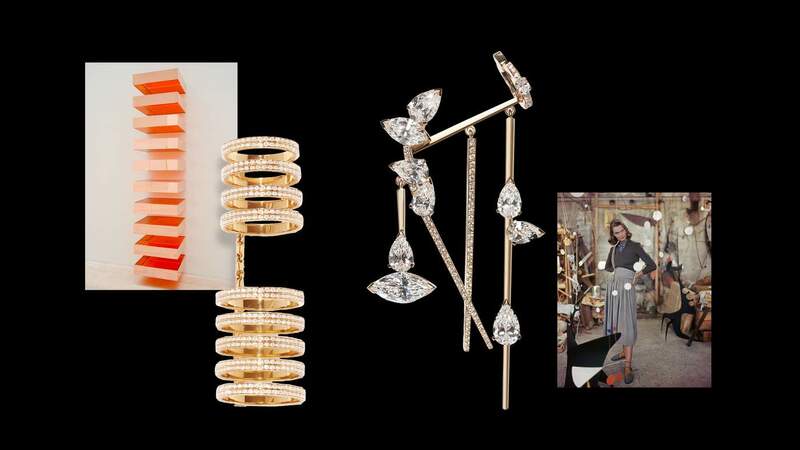 “Man Ray exemplifies that great joy of artist’s jewellery: storytelling,” says Guinness. It was a love of cars that lead to the creation of his Optic-Topic mask, wrought in gold it was designed to protect his eyes before the advent of the windscreen. 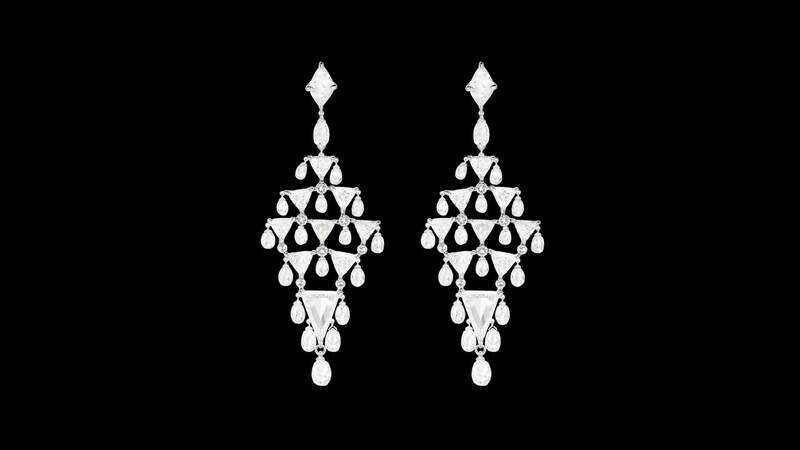 While his gargantuan Pendantif-Pendant earrings drew from the spiralling form of a lampshade he’d created in 1919. Designed to loop over the ear, the screen beauty Catherine Deneuve wore them best when she sat for one of the final portraits taken in the artist’s rue Férou studio. 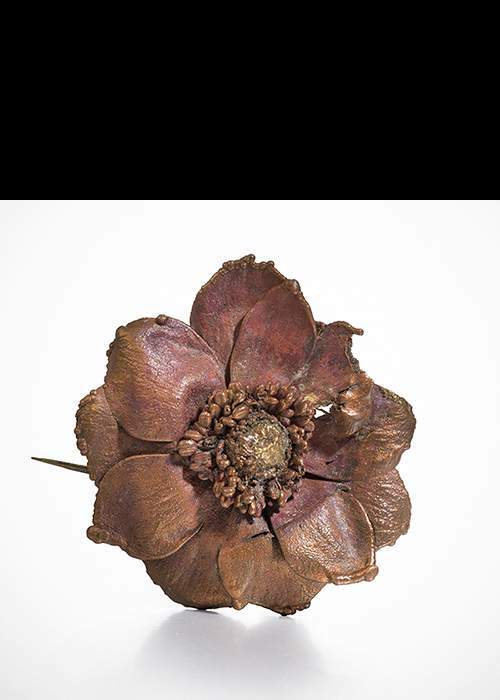 Revered French artist Claude Lalanne began making jewellery as presents for friends in the 1960s. 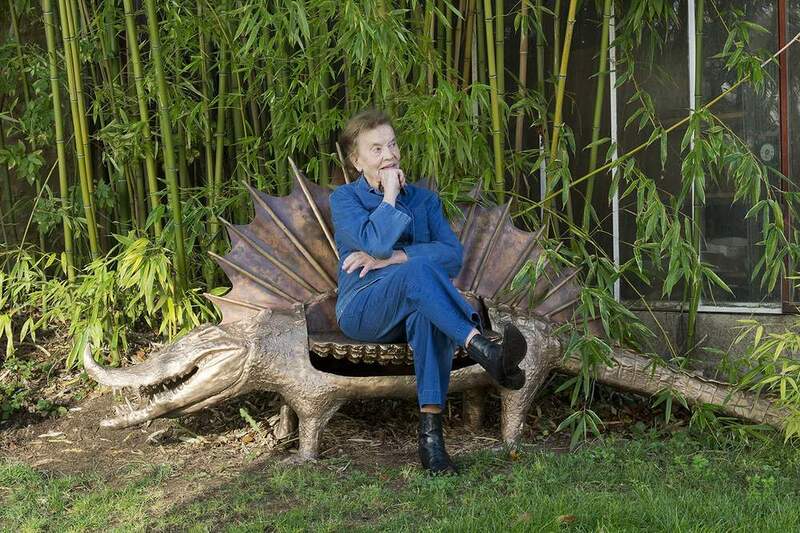 Now 92, she is one of the most prolific living artist jewellers. “In comparison to sculpture, making jewellery is a very delicate process,” explains Lalanne, who draws inspiration for her organic designs from the garden of her home in northern France. “I like to make works that feel alive.” Her creative process is not without hazards though. “Even now my hands are scarred with burns from my blowtorch,” says the artist who finally galvanises the metal to lend it its signature rose tinted hue. 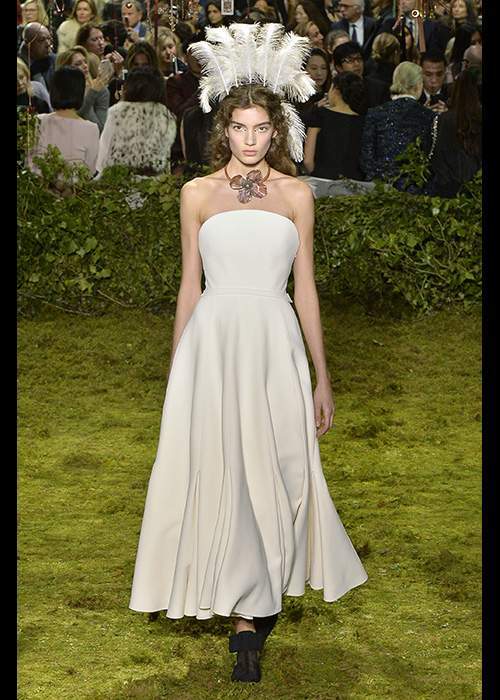 This year Lalanne’s sculptural blossoms, brambles and her beloved butterflies adorned models wrists and waists at the Spring 2017 Dior Couture show. 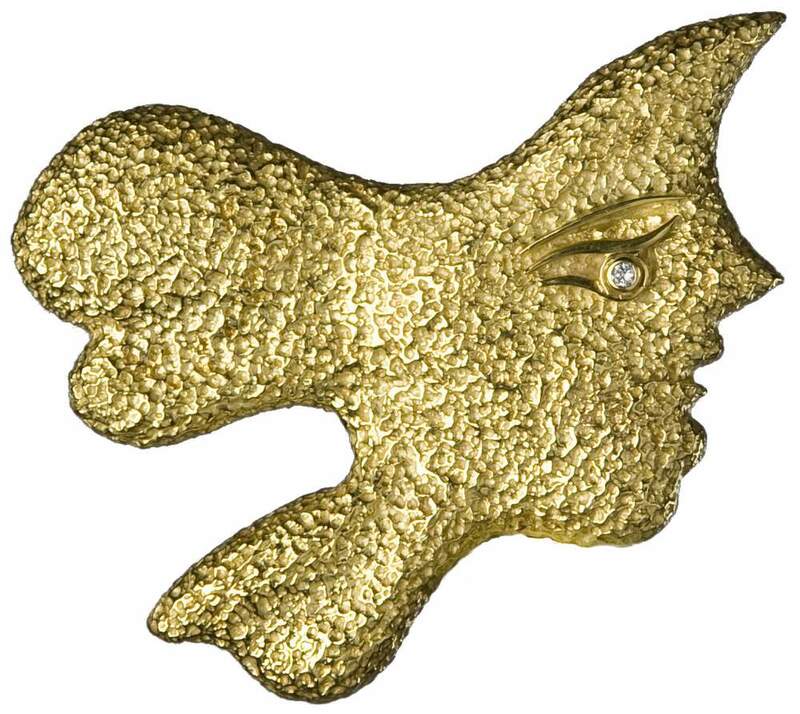 In 1961, towards the end of his life, the celebrated Cubist painter Georges Braque began designing his first collection of one-off jewels. 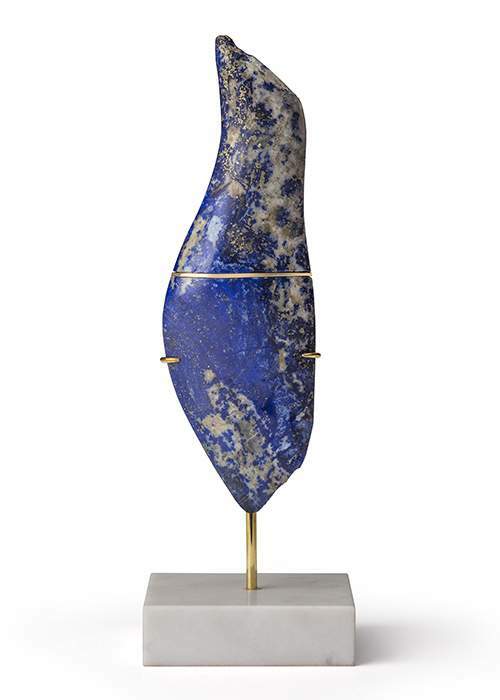 Working with the place Vendôme sculptor, jeweller and lapidary Héger de Löwenfeld, theirs was a sublime meeting of creative minds: together they conceived sculptures, tapestries, ceramics and exquisite jewels. 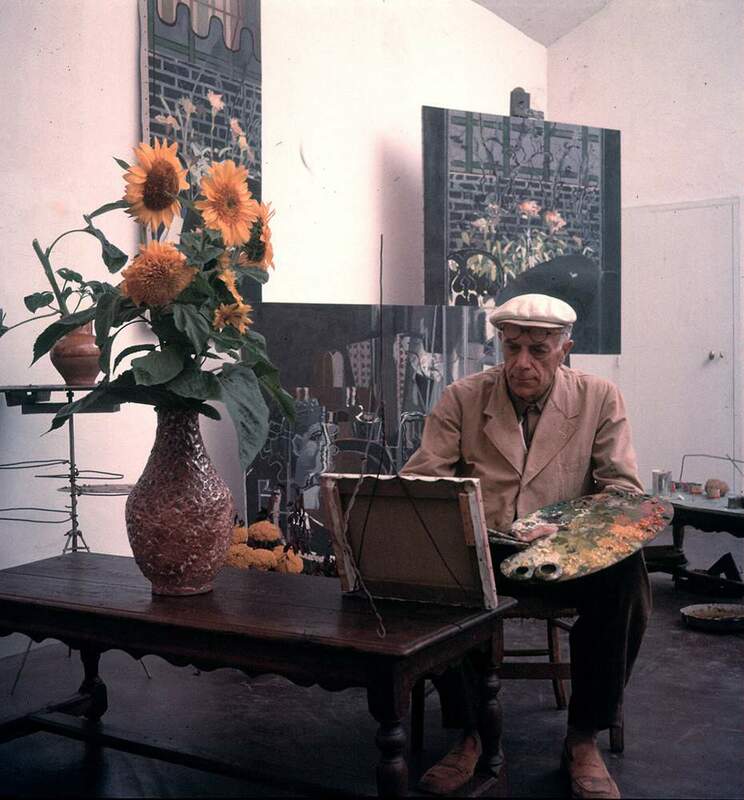 Braque called his collaborator, “the extension of my hands”. 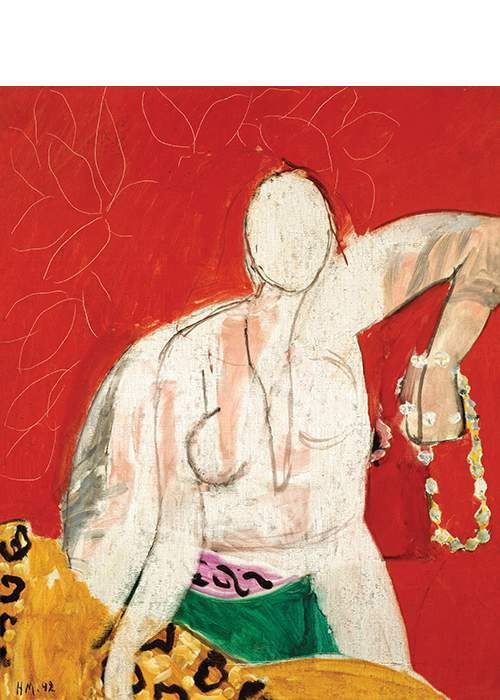 Their totemic creations borrowed from the French artist’s rich iconography, and culminated with a wildly successful Paris exhibition, One Hundred Works By Georges Braque, which opened just three months before the artist’s death in 1963. 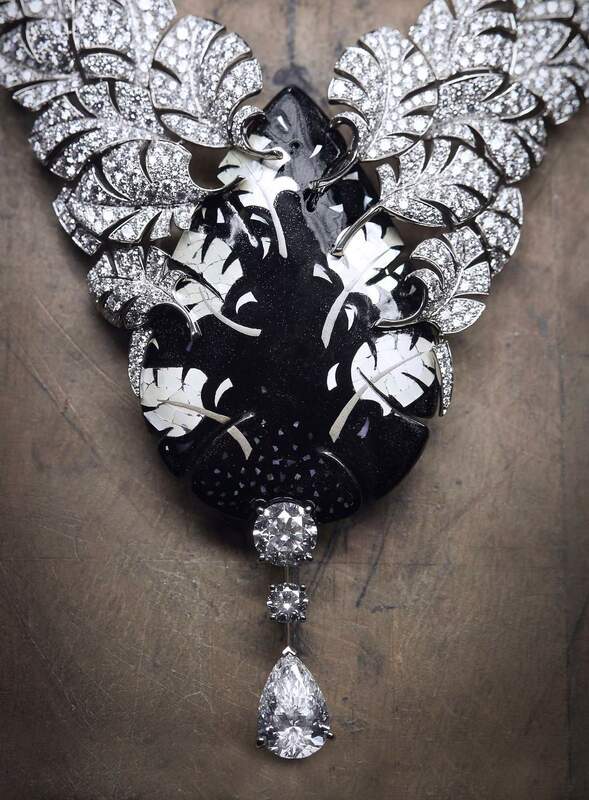 There are brooches embellished with Tahitian pearls, cameos fashioned from gouaches bearing portraits of Persephone, and a veritable flock of diamond-clad birds in flight, an especially poignant recurring motif that can also be found painted on the ceiling of the Salle Henri II in the Louvre. It was a protracted process: it took de Löwenfeld nine months to transform Braque’s “Greek Head” gouache into the sardonyx jewel of the Circé ring. Yours in ceramic sculptural form for €25k. 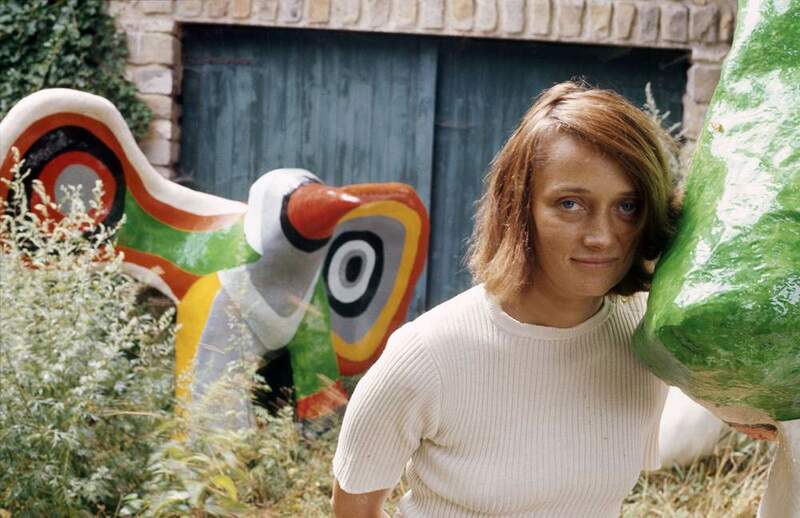 Niki de Saint Phalle was a fascinating figure. The French-American artist, feminist and sometime model, who was photographed for Vogue by Horst P Horst in the 1950s, was also an occasional artist jeweller. 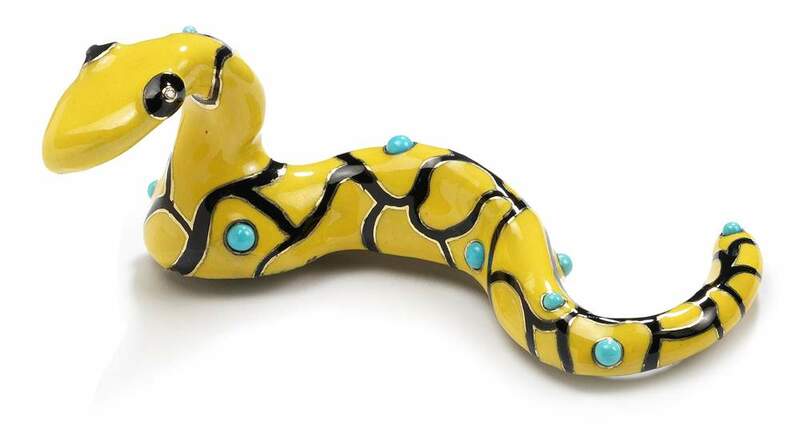 Best known for the army of Rubenesque sculptural figures that she called “Nanas” (French slang for women), de Saint Phalle refashioned these bright, big-bosomed creatures into a fantastical series of jewels during the 1970s. The artist – who was a muse for Julie de Libran’s recent rainbow bright AW17 Sonia Rykiel show – would sketch her surrealist configurations of hearts and hands, serpents and dynamic dancing Nanas in pen, pencil and collage on paper. 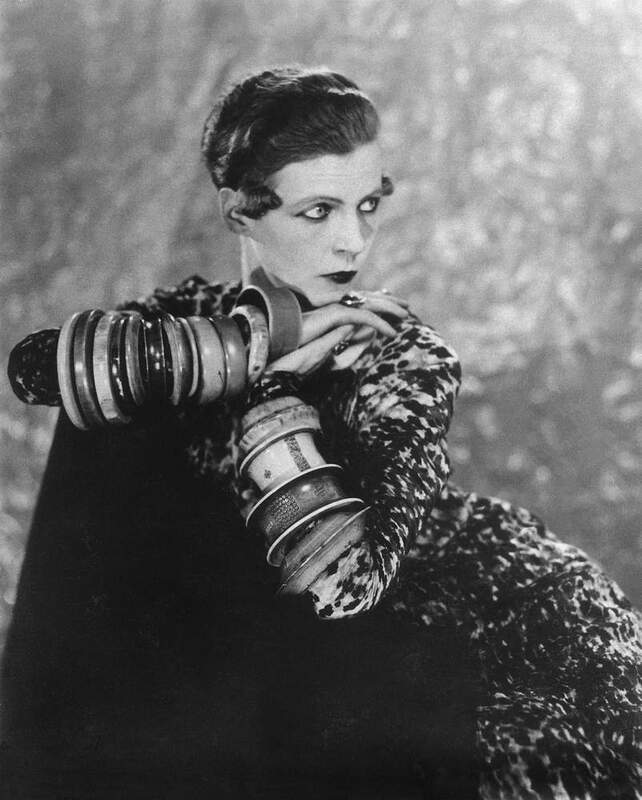 It was down to the skilled artisans of Gem Montebello (the Italian workshop which produced jewellery by a number of artists including Sonia Delaunay, Man Ray and Hans Richter) to realise her visions; a notoriously tricky feat that often took many months. I first fell in love with pearls the very same day that I fell in love with literature. I can remember exactly where I was sitting – on a warm, sun-drenched spot of carpet under a window in my grandmother’s house. I can remember the sound of the birds outside, and the smell of the pages of the book that I had found on a dusty shelf. I liked its title – there was magic in it – and its promise to take me to another world. Tender is the Night did not let me down. I was transported, instantly, from the English countryside to the French Riviera. I sheltered under a broad umbrella on the beach, watching a beautiful group of people – and one woman in particular – basking in the burning sun. A hazardous endeavour, that for centuries involved ropes, stone weights and a great deal of trust between a diver and his mate in the boat above, pearl diving was seen, by early Islamic pearl hunters in the Arabian Gulf, as a test from God; the pearl a reward for the true believer. Century after century, across culture after culture, pearls have fascinated humanity, not least because of the mystery surrounding their creation. Early Hindu mythology held that pearls were made from dewdrops that the molluscs absorbed when they rose to the surface of the sea at night to breathe. Ancient Greeks considered them the result of lightning strikes. To the Romans, they were the frozen tears of gods. The truth, as is sadly so often the case, is much more prosaic. When a foreign body is caught inside the shell of a mollusc (not just oysters – Who knew? – but also clams and mussels), the tender flesh is irritated into secreting a protective substance. Over time, this substance solidifies into layers of nacre. If a genuine pearl is cut in half, it can be seen to be made up of rings, just like the trunk of a tree. The more layers a pearl has, the more capable it is of refracting the light and basking its wearer in that wonderful iridescent glow. But forget its excretal origins. It is the rarity of a perfect pearl that is the secret of its allure. While only one in every 2,000 oysters produces a pearl, only one in every 10,000 of those is deemed round enough, flawless enough, to be used as a jewel. And herein lies the true power of the pearl. Because the pearl, over and above all else, is a flawlessly formed paradox, a priceless piece of perfection borne of a routine physical function. Simple and mysterious, the pearl has, over time, also added layer after layer to its own story, becoming a tiny emblem of a much bigger picture. Take a walk through the annals of history, and you will find the simple pearl reigning supreme. 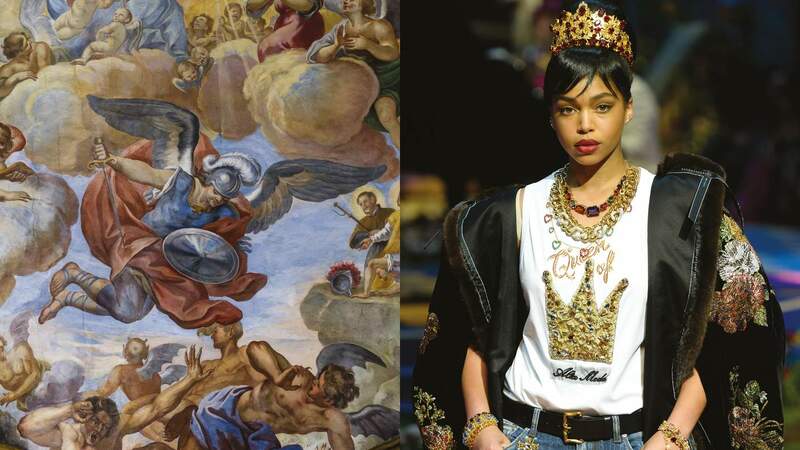 A marker of luxury until the Medieval period (as a sign of her wealth and power Cleopatra famously dissolved a priceless pearl earring in a glass of wine and drank it), it then began to be viewed as a Christian symbol of purity and chastity. Here, after all, was a gem that Matthew deployed in his New Testament book to signify the great value of the Kingdom of Heaven (“The kingdom of heaven is like a merchant in search of fine pearls”, Matthew 13:45). 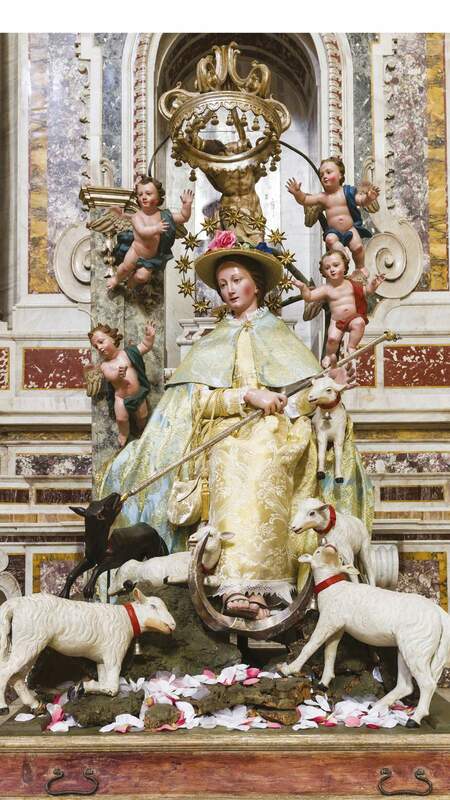 As time passed, the gems’ own capacity for miraculous conception saw them naturally associated with the Virgin Mary, a link which was then exploited by the Virgin Queen, Elizabeth I. A passionate pearl enthusiast, Gloriana – whose own father Henry VIII had used pearls (most notably in Hans Holbein’s famous 1536 portrait of the king, codpiece and all) to advertise his virility – had pearls painstakingly sewn into all of her clothes to emphasise her purity. 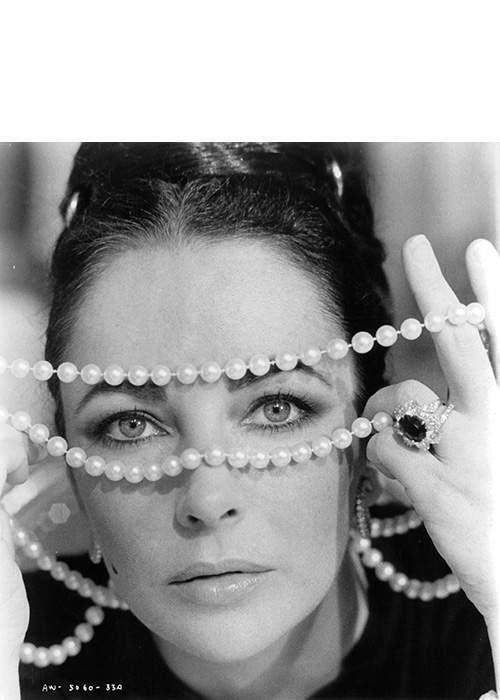 Customarily, she also wore seven or more ropes of large, fine pearls, the longest of which extended to her knees. 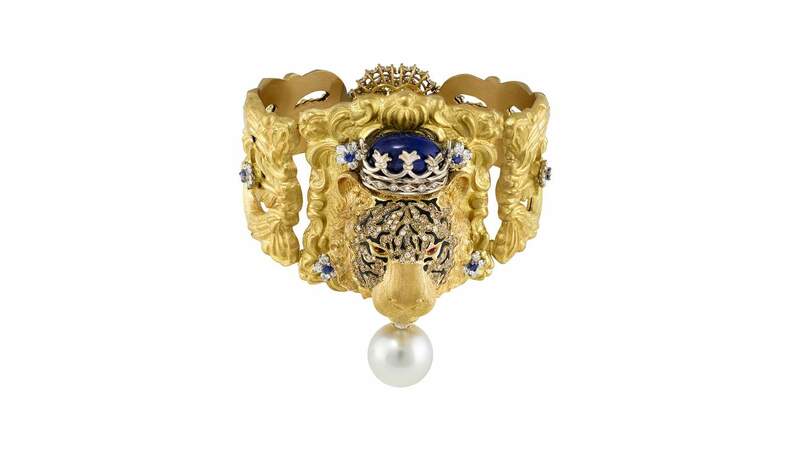 Less than half a century later, in 1649, Charles I deployed the pearl as a signaller of his own innocence and purity when he went to his execution wearing a single pearl earring. 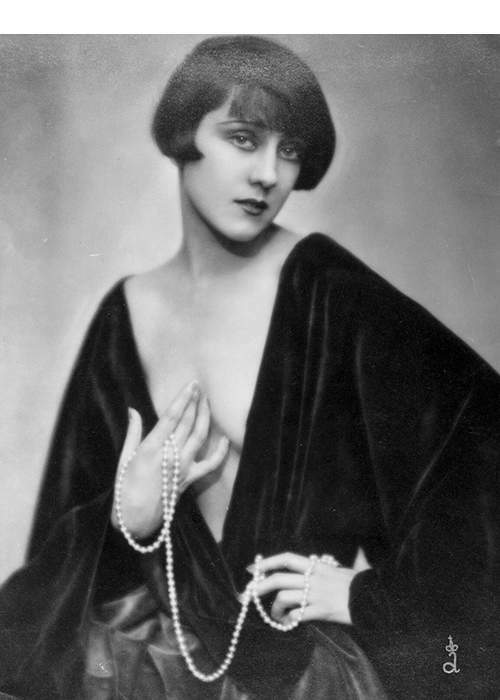 Influence and chastity, power and purity; the pearl’s real secret weapon is its ambivalence. 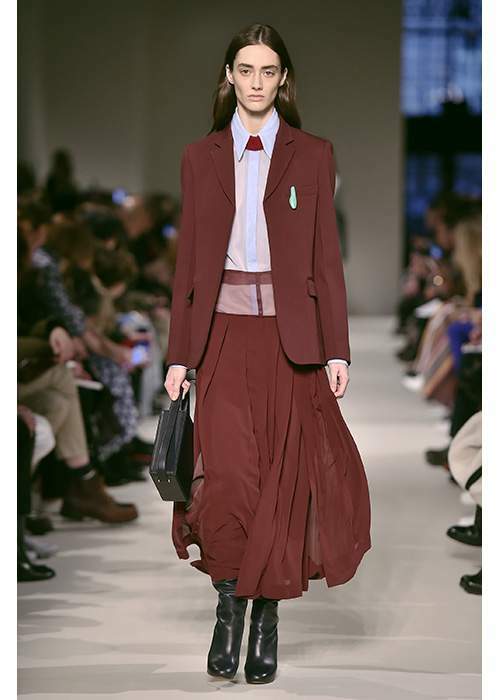 Because, with ambivalence, comes power; the power for the wearer to be exactly who or what they want to be. Thus a debutante can be a beautiful innocent, quivering at the beginning of her adult life, and Rihanna can be a knowing minx; Margaret Thatcher can be a woman in charge and Marilyn Monroe (who wore the same simple string of Mikimoto pearls that her one true love, Joe DiMaggio, gave her on their honeymoon to their divorce hearing just nine months later) can be a woman on the edge. 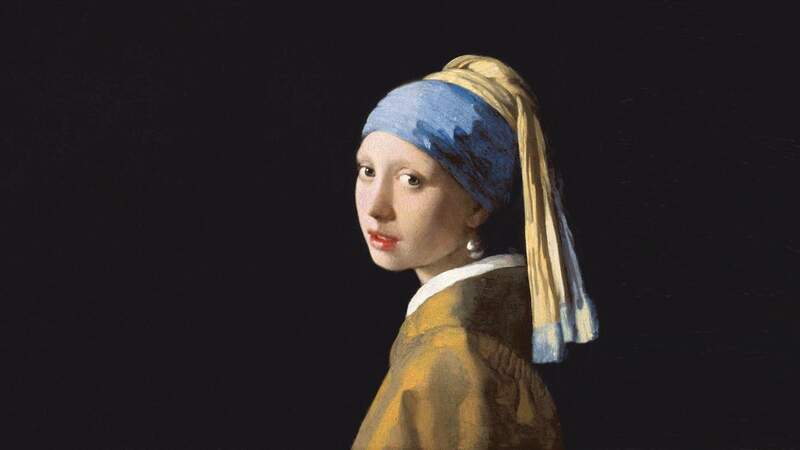 And staring boldly but trepidatiously out of the canvas of Johannes Vermeer’s celebrated 17th century oil painting, The Girl with the Pearl Earring can be all of these things, and yet none of them. 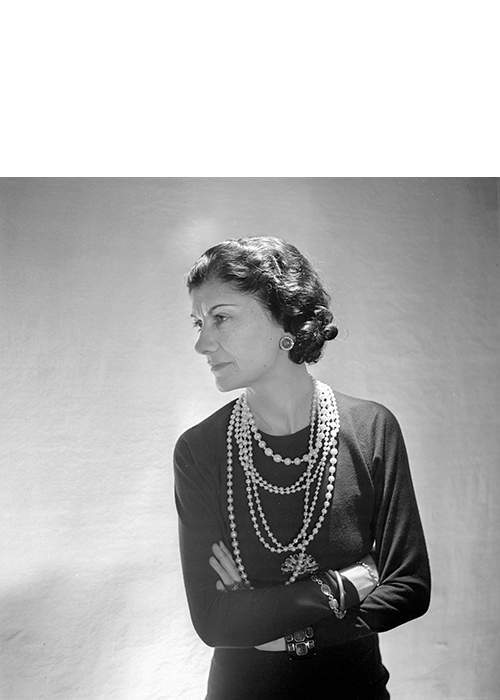 Fashion, that cultural magpie, has enjoyed an enduring love affair with the pearl; a tryst that was cemented, and democratised, by Coco Chanel, a woman with her own mysterious origins. 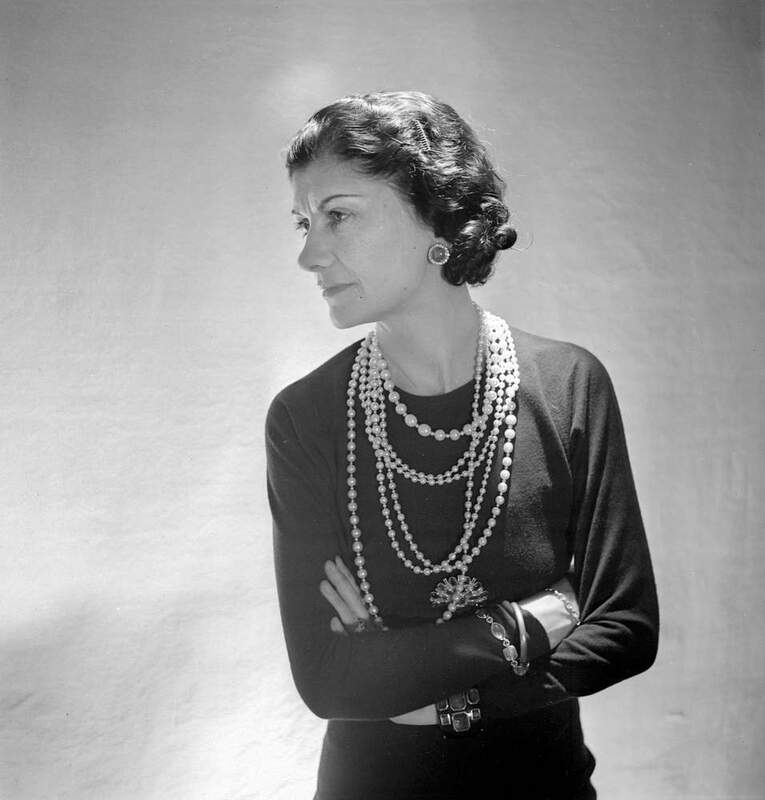 As Christian Dior once mused, not without a whiff of resentment, “With a black pullover and ten rows of pearls, she revolutionised fashion.” Despite being presented with a yard of real pearls by her lover the Duke of Westminster every birthday and Christmas, Chanel was more than happy to play with the fake variety. 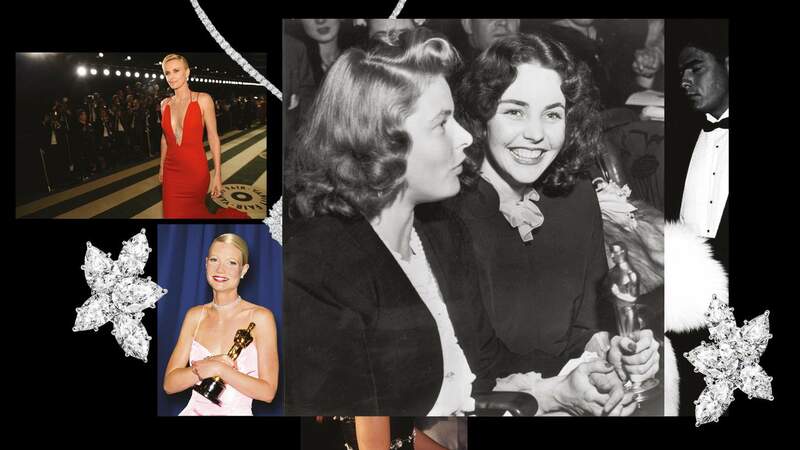 In the decades since, as climate change and overfishing have made the uncultivated pearl a rarer and rarer find, the fake pearl has continued to reign supreme on catwalks and red carpets the world over. With none of the hardened snobbery of the diamond, the pearl will shine its light on anyone who will have it, be it the Duchess of Cambridge or Dita Von Teese. It is just as happy to wink and flirt, as it is to curtsey and nod. But what it will always do, however it’s worn, is allude, and speak of something beyond itself I read Tender is the Night in a single sitting; a whole, blissful day lost to literature. Underneath Nicole Diver’s beautiful brown back, set off by a string of creamy pearls, was indeed a heart full of secrets and suffering; layers of life hidden beneath the stillness, drawing me deeper and deeper in, until there was no turning back. 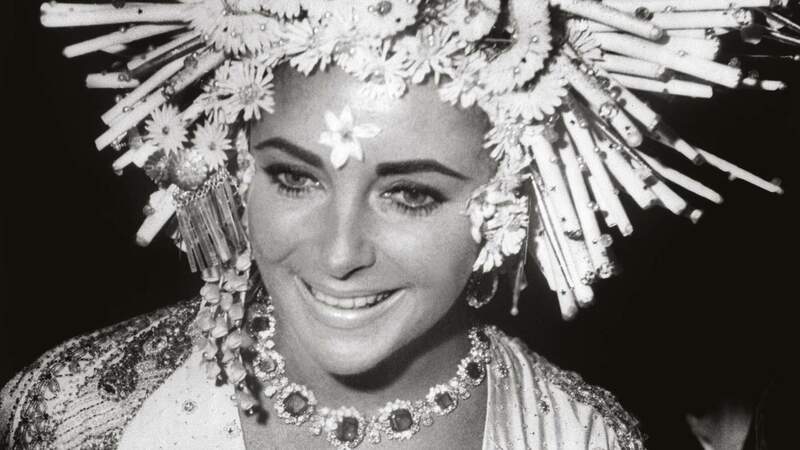 “Elizabeth Taylor was the first real red carpet diva,” says Bulgari’s creative director Lucia Silvestri. 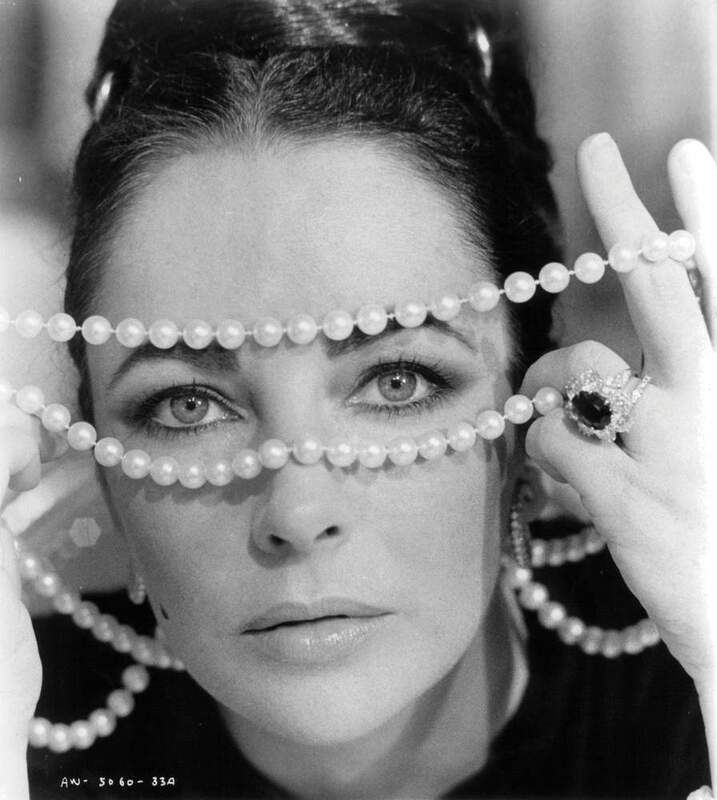 The relationship between the actress and jewellery house began in Rome in 1963, at the same time as her love affair with Richard Burton. In the city to film Cleopatra, Taylor would visit the house’s founder Gianni Bulgari in the nearby Condotti store on her breaks. The store became a favourite hideaway for the couple seeking to escape the paparazzi (they even enjoyed exclusive use of a secret entrance). 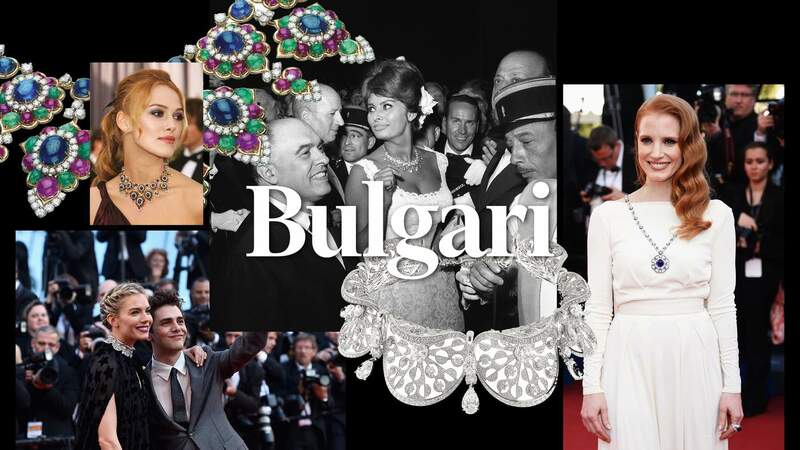 Bulgari soon became testimony to their tempestuous relationship: Burton’s many gifts to Taylor included a 60.5 carat Colombian emerald necklace which Taylor wore at their first wedding in 1964. And long after their divorce. Sophia Loren was one of the house’s early ambassadors. 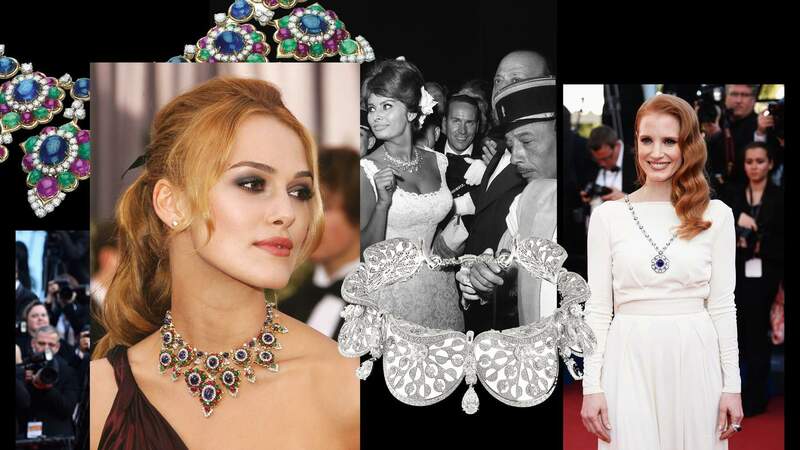 More recently Sienna Miller, Nicole Kidman and Keira Knightley have worn Bulgari on the red carpet. 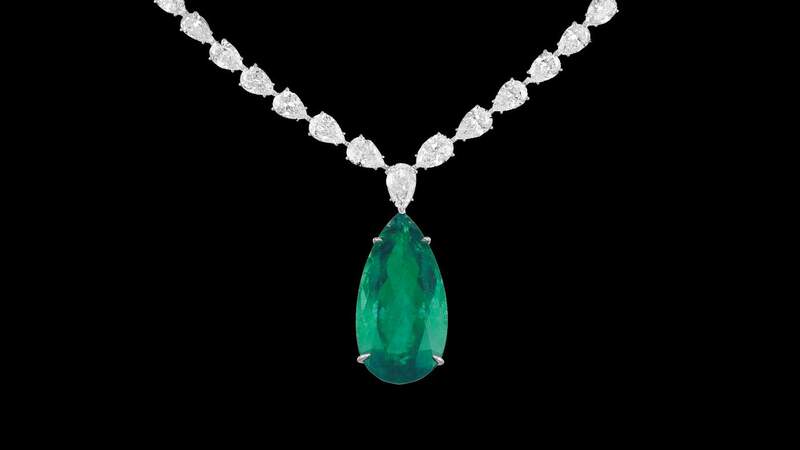 Many of the pieces have glamorous pasts: the emerald, sapphire and diamond necklace worn by Knightley to the 2006 Oscars was created in 1967 for the Shah of Persia, while the fabled Serpenti necklace has charmed everyone from Julianne Moore to Naomis Watts and Campbell. “Movie stars are now part of our DNA,” says Silvestri. 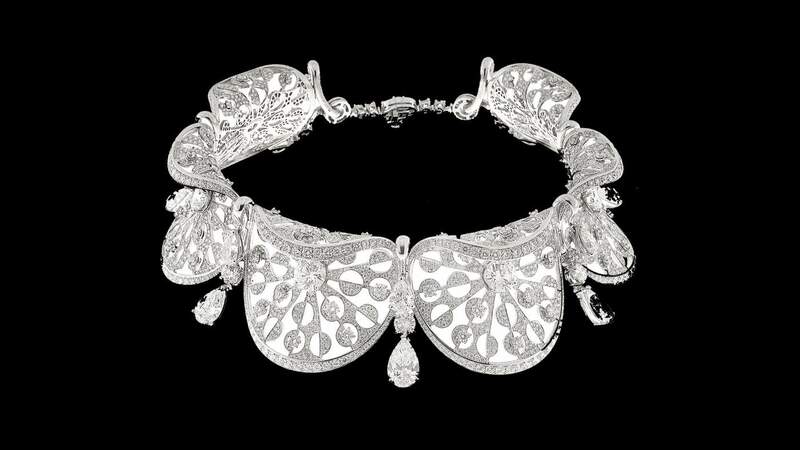 Founded in Geneva in 1993, De Grisogono has dressed aristocracy and actresses alike. 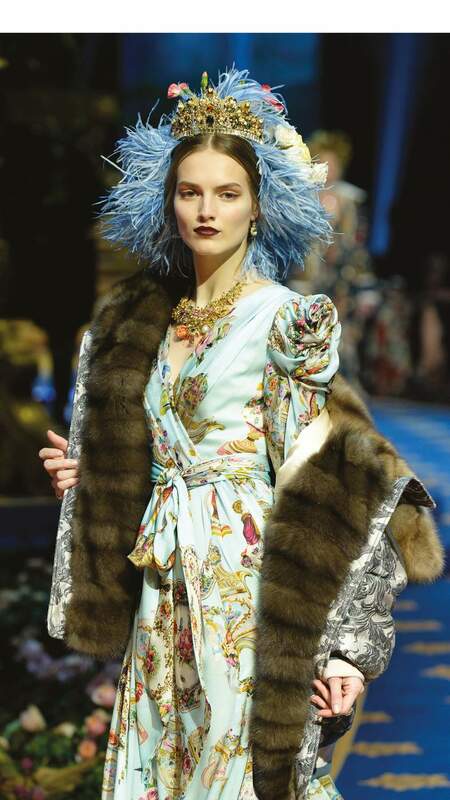 Models Bella Hadid, Naomi Campbell and Jourdan Dunn favour its colourful diamonds and contemporary designs, while royals including Prince Emanuele Filiberto of Savoy are friends of the house. In 2001, founder and creative director Fawaz Gruosi cemented the brand’s place at the Cannes Film Festival with the launch of a lavish party which takes place at the Hôtel Du Cap-Eden-Roc. 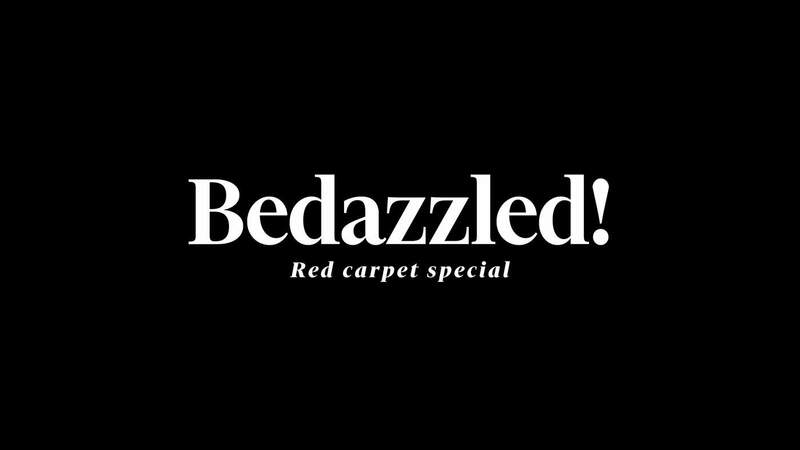 Last year, among the guests were Leonardo DiCaprio, Chanel Iman and Karlie Kloss, who wore jewellery pieces made up of over 1,000 diamonds. 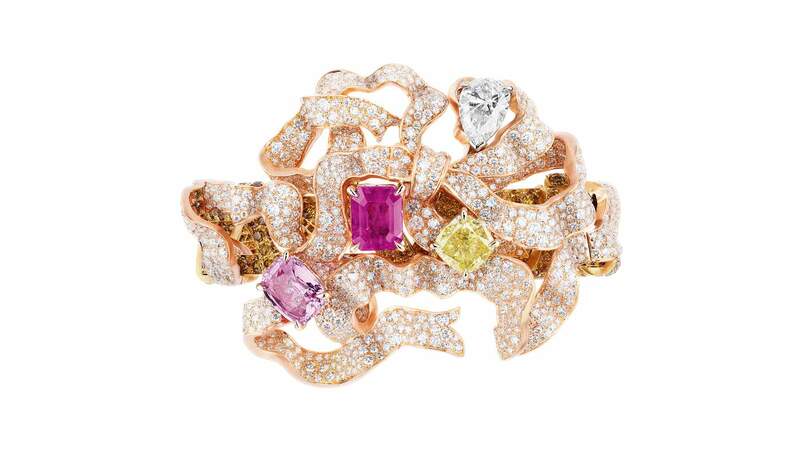 “The success is due to the beautiful people and jewellery,” says Gruosi. 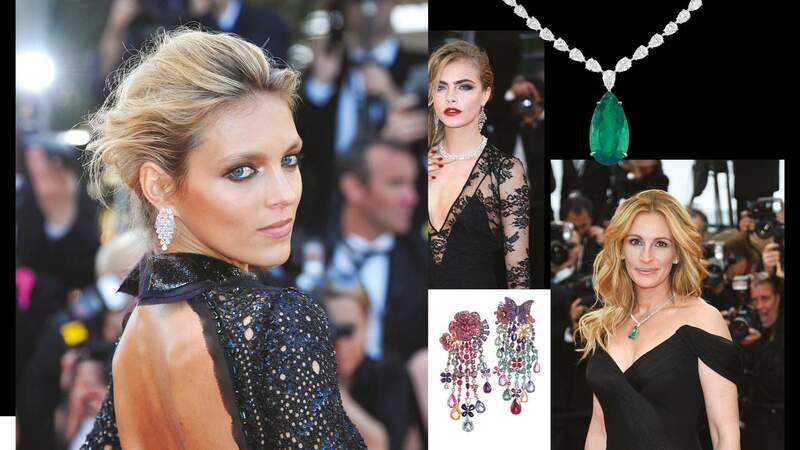 “The key is to mix celebrities, royal subjects and friends, all on one very glamorous evening.” De Grisogono’s Gypsy earrings – a cluster of intertwined ellipses embedded with sparkling gemstones – has racked up impressive red carpet mileage having been worn by Kloss (pictured, in 2015) and Charlotte Rampling. Gruosi is as much a regular of the carpet as his baubles: in recent years he has accompanied Natalie Portman and Heidi Klum to events. 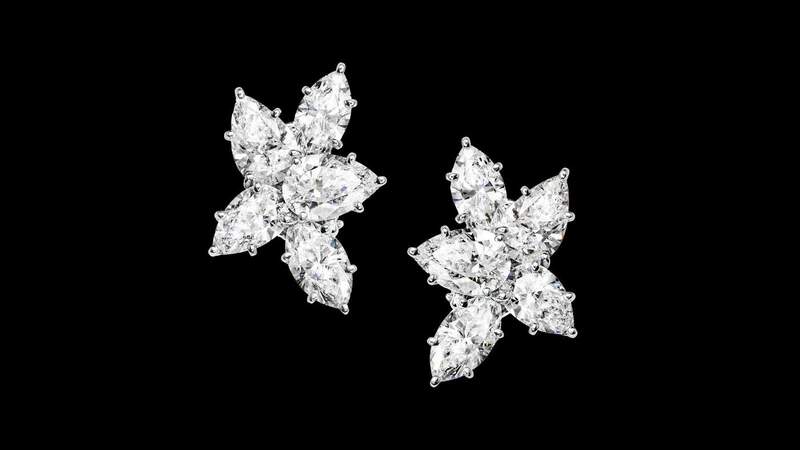 Known during his life as the “jeweller to the stars”, Harry Winston revolutionised the red carpet in 1944 when he became the first jeweller to loan diamonds to an actress for the Academy Awards. The star in question was Jennifer Jones, who went on to win the award for best actress for The Song of Bernadette. 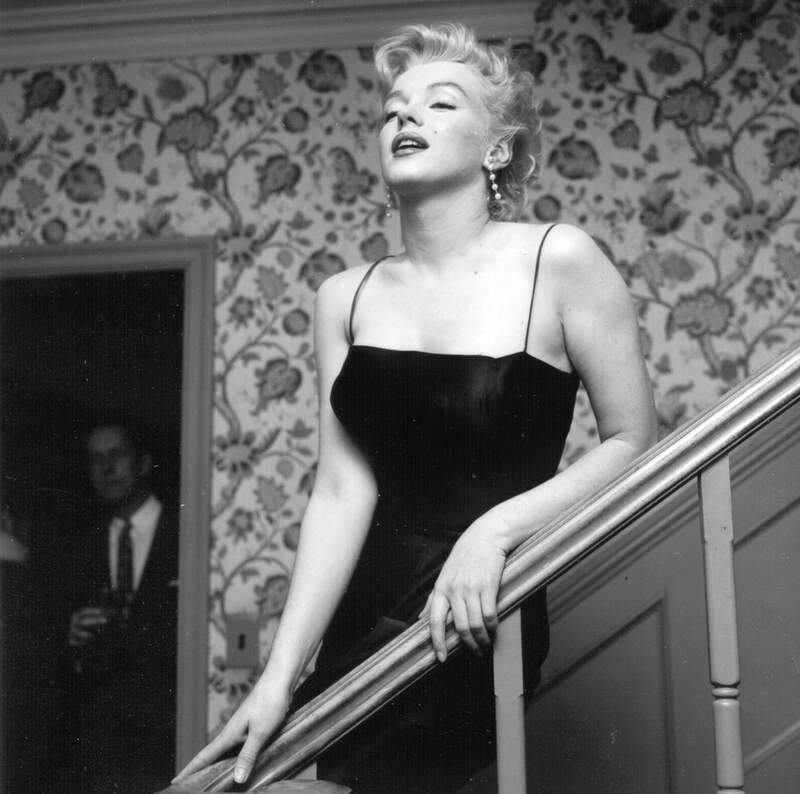 The house has continued to dress red carpet royalty ever since. 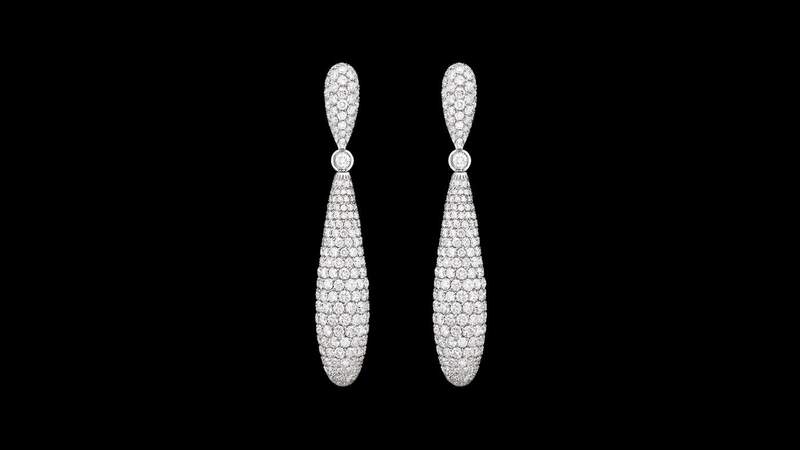 Harry Winston jewels have proven to be something of a good-luck charm for its wearers: Scarlett Johansson, Gwyneth Paltrow and Jessica Chastain have all won in Harry Winston – Chastain wore a total of $3m worth to collect the 2013 Best Actress Golden Globe for her role in Zero Dark Thirty. The house also claims ownership of the world’s largest orange diamond, which was transformed by the New York-based maison into a “pumpkin diamond ring” and worn by Halle Berry at the Academy Awards in 2002 – the year she won the award for best performance by an actress for her part in Monster’s Ball. 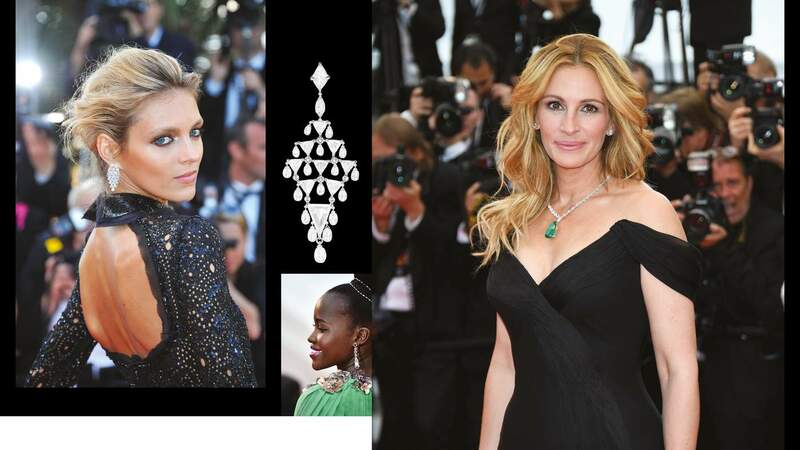 Chopard’s glittering association with the Cannes Film Festival dates back to 1997 when its co-president and creative director Caroline Scheufele redesigned the trophy for the festival’s top prize, the Palme d’Or. Four years later, the house launched the Trophée Chopard, given each year to recognise and encourage the careers of two young actors. 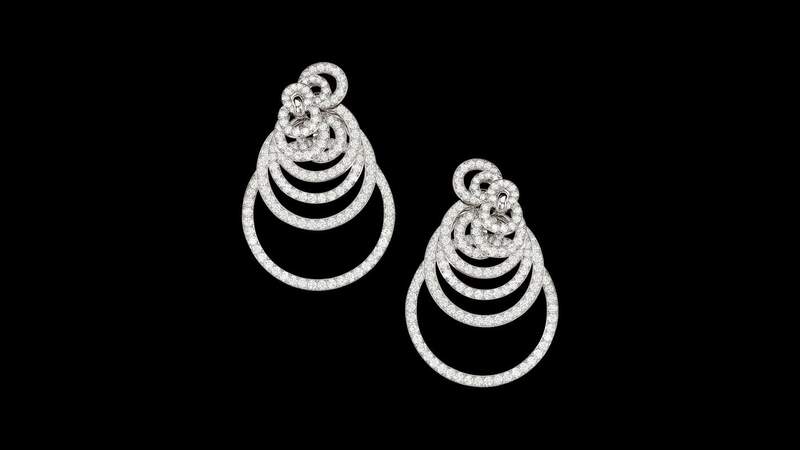 And for the past decade the house has created a dedicated haute joaillerie red carpet collection of designs numbered to match the edition of the year’s festival. 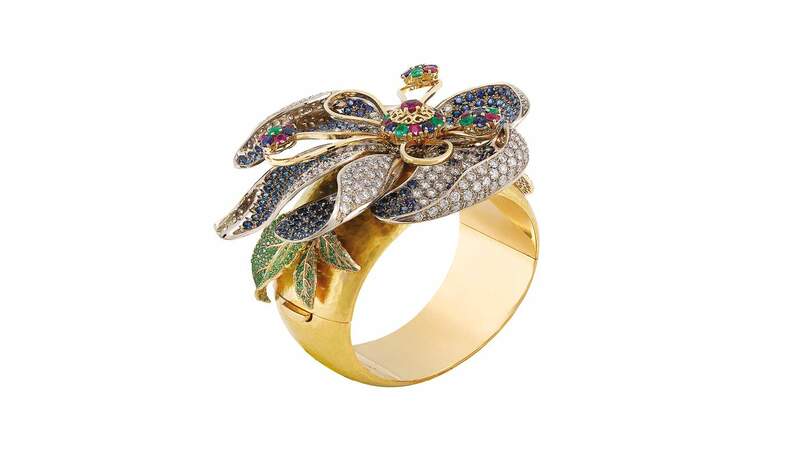 This year has found the house partnered with Rihanna on a 70-piece collection inspired by the singer’s Bajan roots, and featuring megawatt orange sapphires and paraiba tourmalines that evoke the island’s lush tropicana. 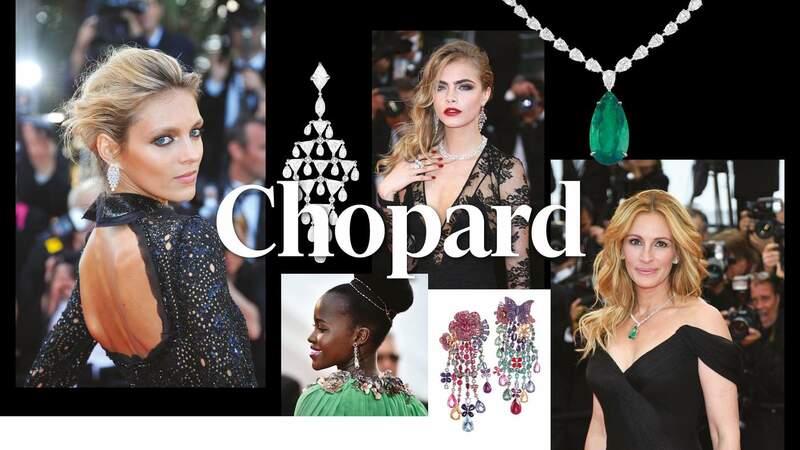 Cannes’ la Croisette has also become the platform for Chopard’s Green Carpet Collection. Launched in partnership with Livia Firth in 2013 to promote sustainable luxury, the collection uses only fair-mined gold. 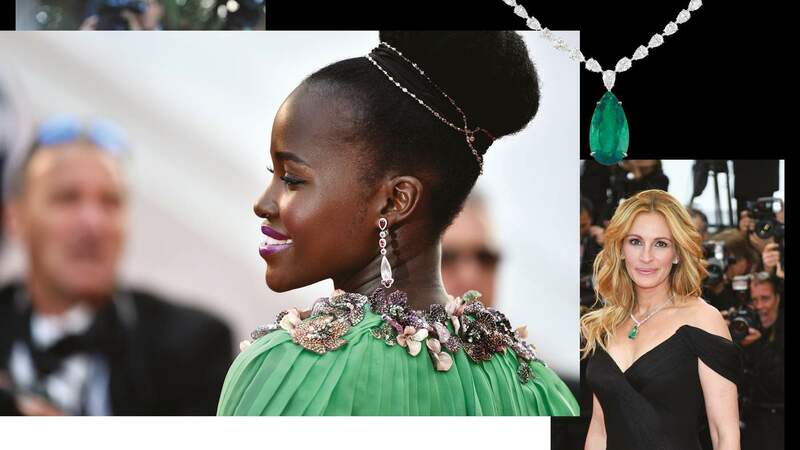 Last year, the house introduced its first collection of ethical gemstones with a 53 carat Zambian emerald and diamond necklace, worn by Julia Roberts, and a pair of 18 carat pear-cut emerald and white gold earrings worn by Julianne Moore. 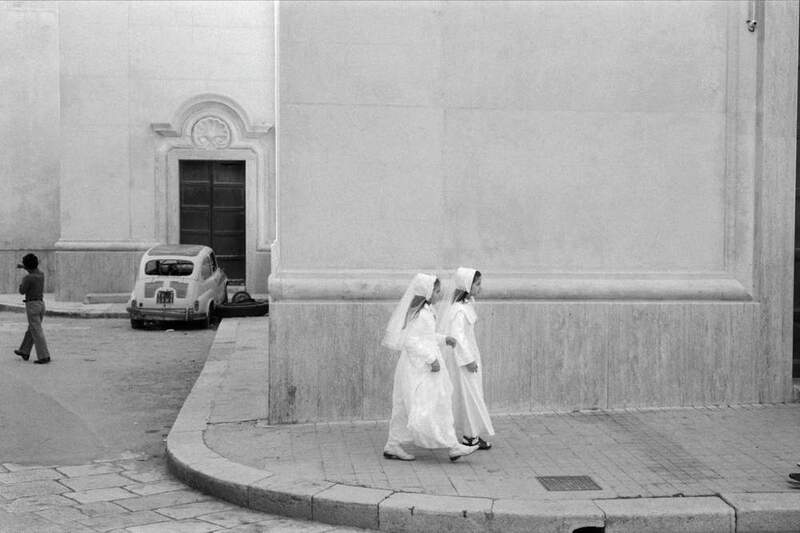 Giacomelli Palace, Treviso © Mauro Magliani/Electa/Mondadori Portfolio via Getty. 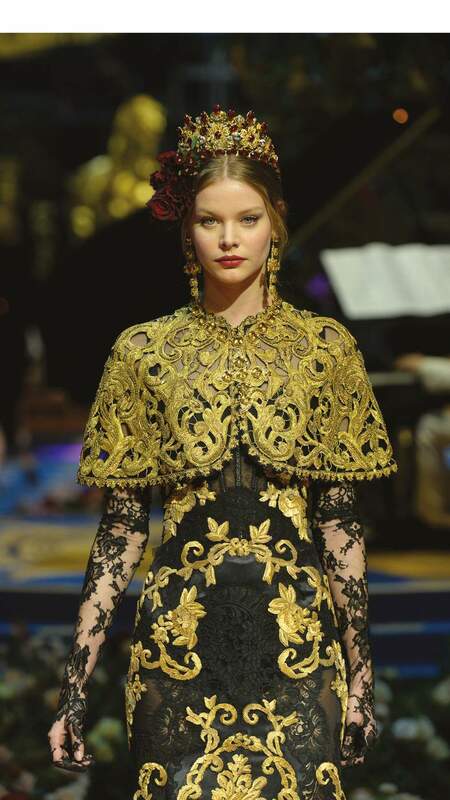 Dolce and Gabbana Alta Gioielleria pieces at the house’s Spring 2017 Alta Moda show. 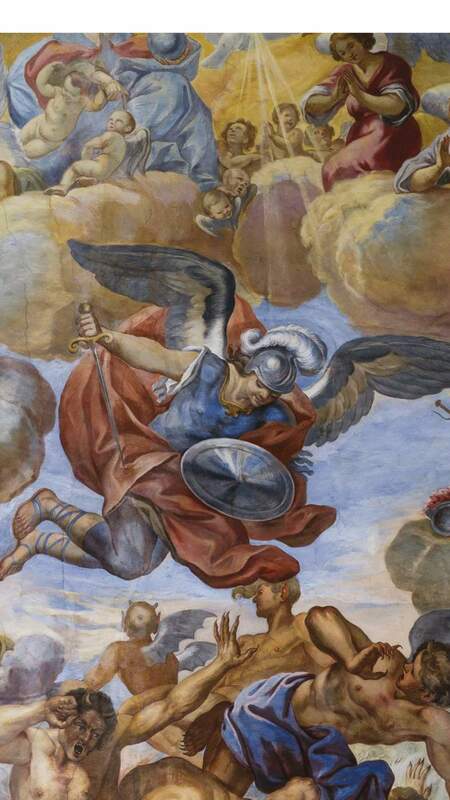 Detail of fresco, Church of San Michele © Rex/Shutterstock. 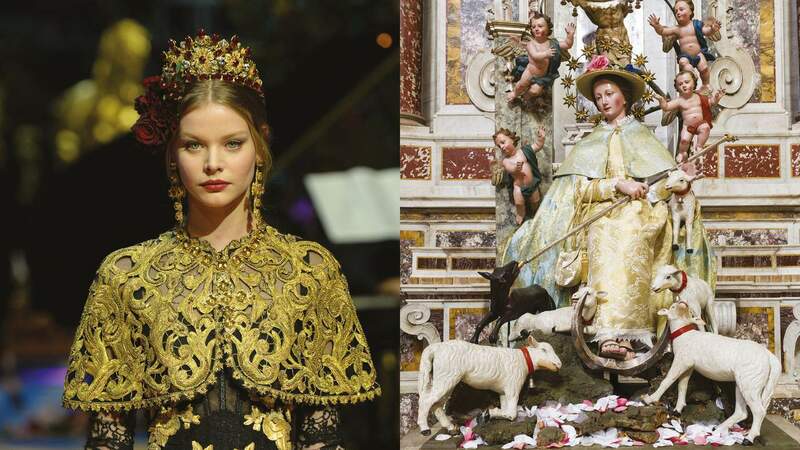 Dolce and Gabbana Alta Gioielleria pieces at the house’s Spring 2017 Alta Moda show. It was always going to be different. 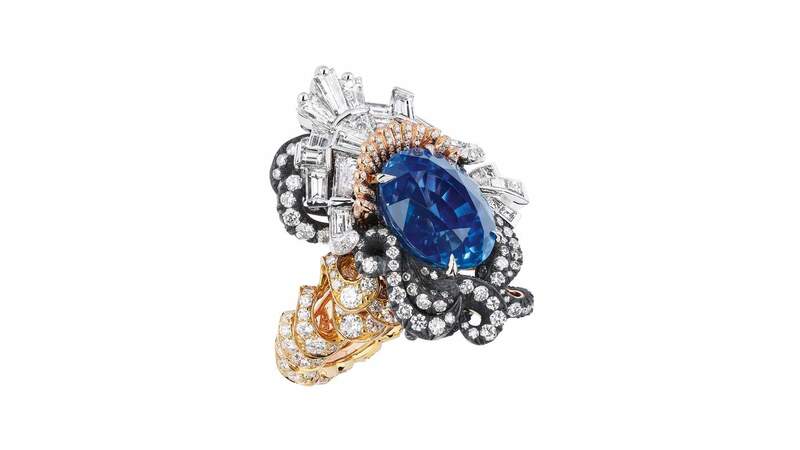 Dolce and Gabbana first unveiled their high jewellery collection, Alta Gioielleria in 2013 to accompany the launch of their couture-line collections. The twice-yearly collections fast became a unique event in the fashion calender, staged at an exclusive location and attended only by a select number of invited clients. 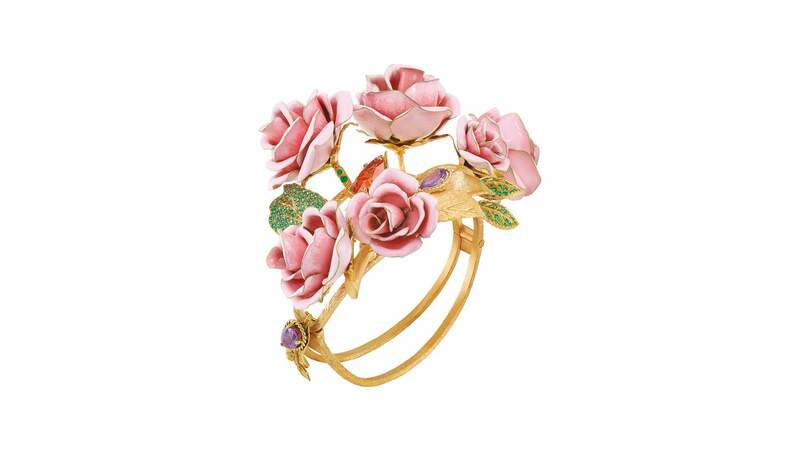 Just like the fairytale clothing, the jewellery is big, bold and fun, combining baroque decadence, gothic symbolism and religious iconography in one-of-a-kind pieces which are both wonderfully kitsch and breathtakingly beautiful. 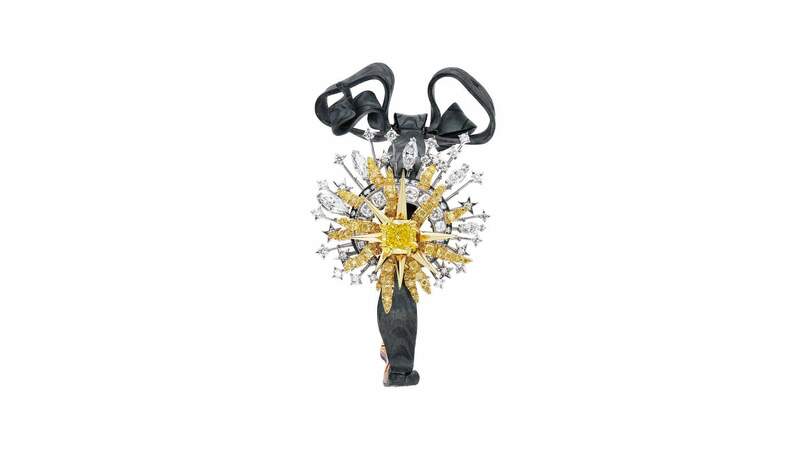 Whereas much of the jewellery world is dominated by a rather germane conservatism, Alta Gioielleria has a playful irreverence. 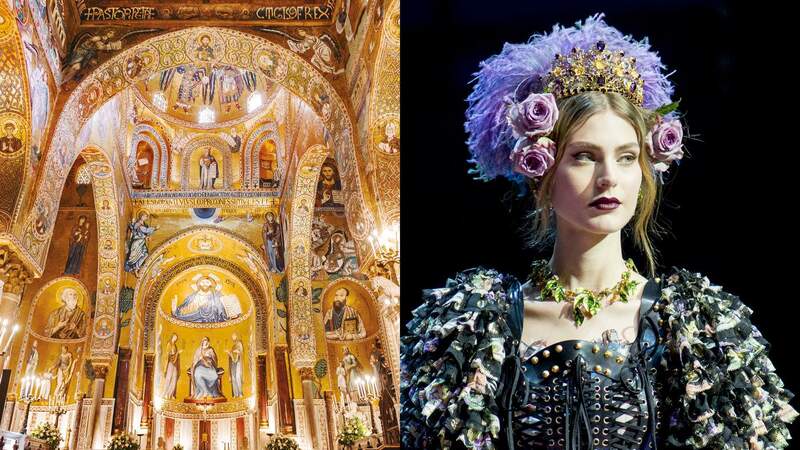 Collections have included huge golden bird-of-paradise earrings, necklaces strung with gem-encrusted crucifixes and giant technicolour flowers. The designs are a hectic hybrid, combining marquetry, enamelling or filigree techniques, a vibrant colour palette and vast, rare gemstones. 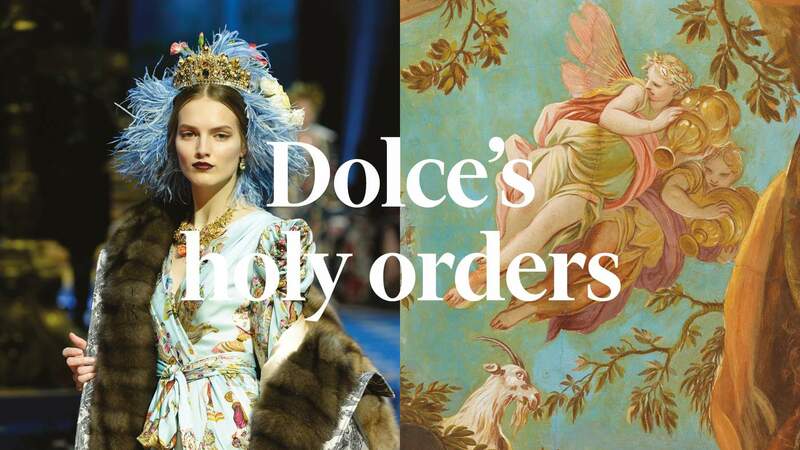 In the exuberant spirit of Dolce and Gabbana style, more is more is more. 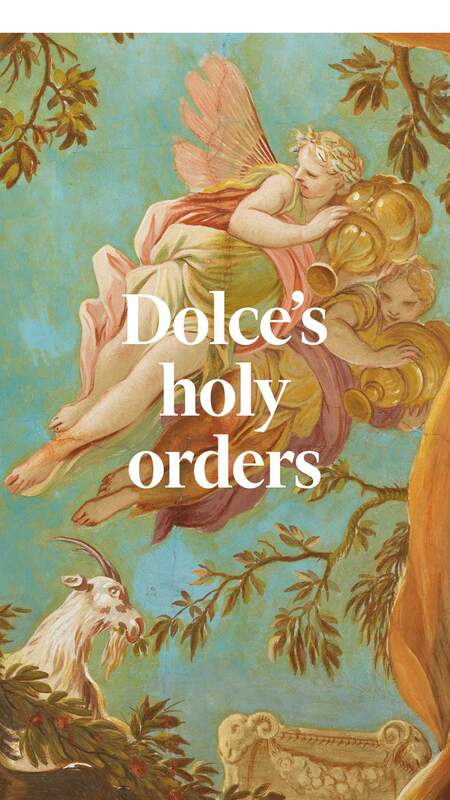 Dolce’s references are only part of a story. 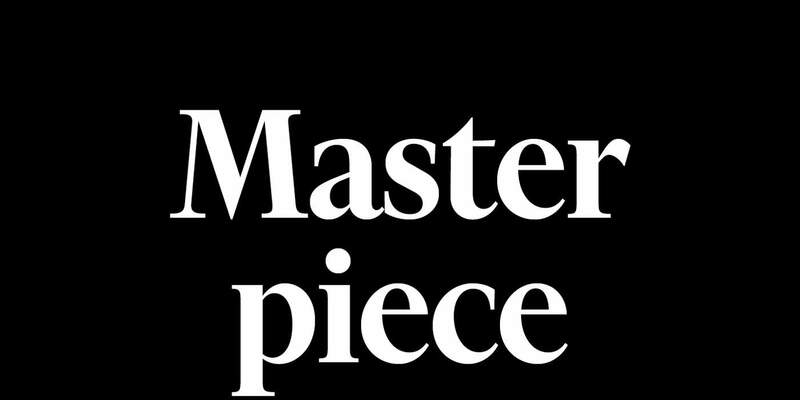 “The pieces are nothing without the character,” he says. “We propose, but at the end of the day, people are themselves. The customer reinvents it. We just help them along that journey. Because we want the pieces to live”. 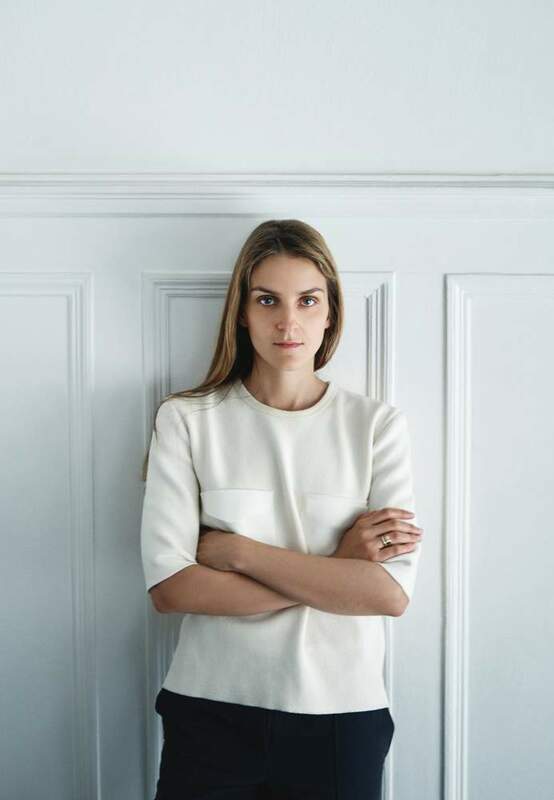 ‘The starting point for a design usually comes from a reference – say a specific architectural hook by Frank Lloyd Wright, or Donald Judd’s furniture,” says Gaia Repossi. 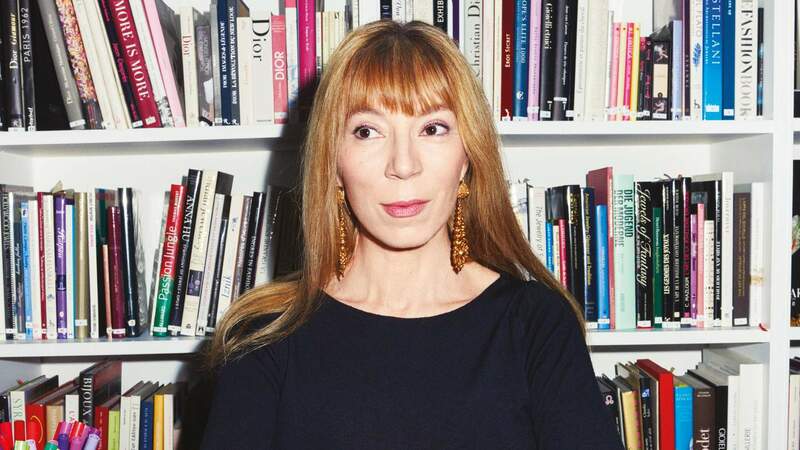 This year marks her tenth anniversary as creative director of the 97-year-old jewellery house founded by her family, and she is explaining her evolving creative process over mineral water at London’s Chiltern Firehouse restaurant. 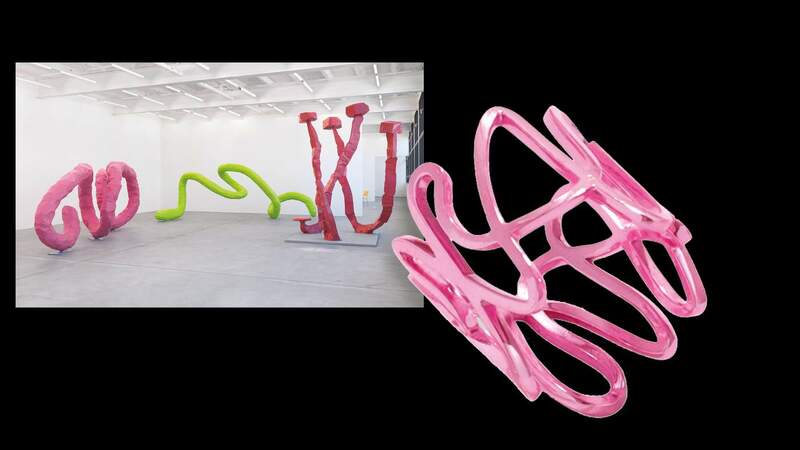 Inspiration is everywhere – she’s just spotted the twisted trunk of a giant pot plant which would be a good basis for a cuff – and the art world is a particularly rich source of ideas. The influence of modern art is apparent in Repossi’s jewellery even before specific references reveal themselves. The former painting and archaeology student’s designs are sculptural, minimal and have a captivating tension between the strict and the playful. 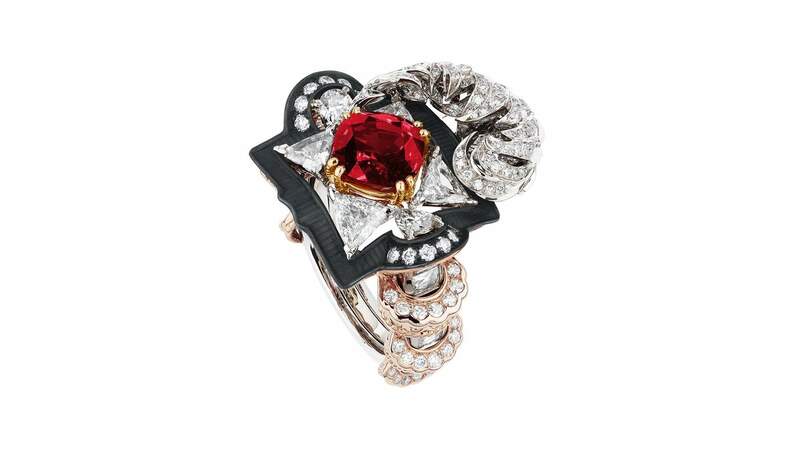 Stars, flowers, or baroque curlicues are nowhere to be seen in her rings or bracelets. The house’s modernity is underlined by the newly redesigned store on Paris’s Place Vendôme. 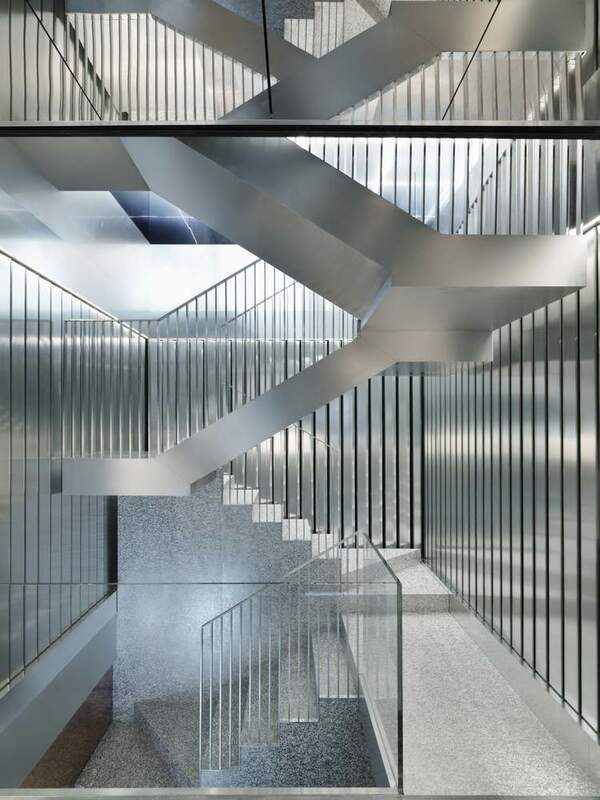 Designed by architect Rem Koolhaas and his OMA team, the three-storey building eschews the inside-a -jewellery box feel of a more classic boutique in favour of a rich futurism. Myriad reflective surfaces, many in a signature rose gold colour, are combined with features intended to fuse architecture and display. “The store was inspired by the jewellery and the jewellery was inspired by the store,” says Repossi of its design which in turn attracts architecture students who come to appreciate Koolhaas’s work, and sometimes end up buying a trinket or two. It also houses furniture by Judd, which she collects. 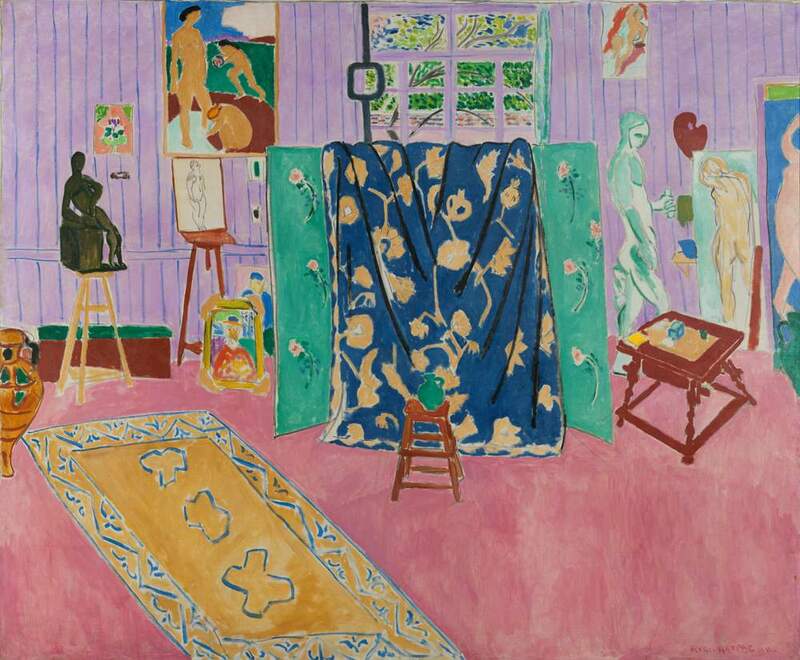 In her Paris home (she spends time too in LA with her boyfriend the artist Jeremy Everett), she has a bed, tables, stools and a bookcase by the late American artist’s studio. “It’s an amazing experience to live with his work,” she says, in her soft Parisian whisper. Judd’s work was also an inspiration behind the Berbère collection. Launched in 2010 it included a range of earrings and rings with ribcage-like stacks of semi-circles that spawned a multitude of copycats. She was particularly drawn to the room full of aluminium Judd boxes at the Chinati Foundation in Marfa, Texas, a museum founded by the artist. Repossi explains, “they have an infinite system, thousands of variations, and I work with systems a lot: certain motifs or colour combinations that repeat throughout the collections”. Concepts from Judd’s geometric, repetitive structures were combined with images from Berber art and the tribal tattoos of the Tuareg, nomads inhabiting the Northern African desert. The result is a collection of rings and earrings with an armour-like, anatomical quality. More decorative is the Suspensions collection, which looks to Alexander Calder. 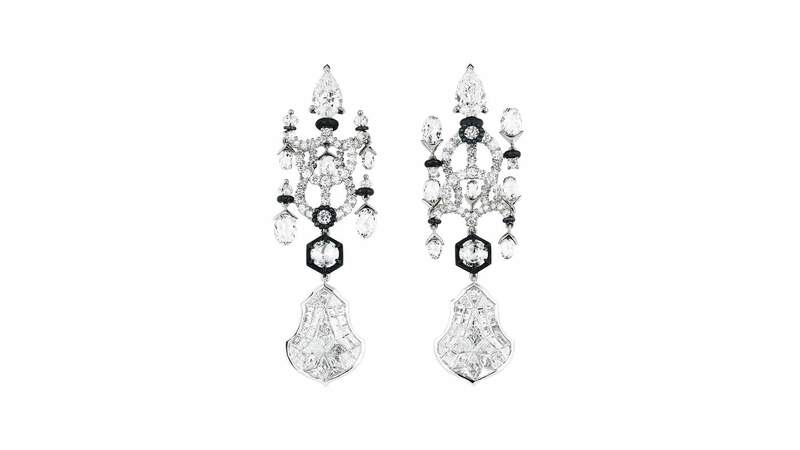 Requiring no piercing, these mobile-like earrings appear to float on their own. 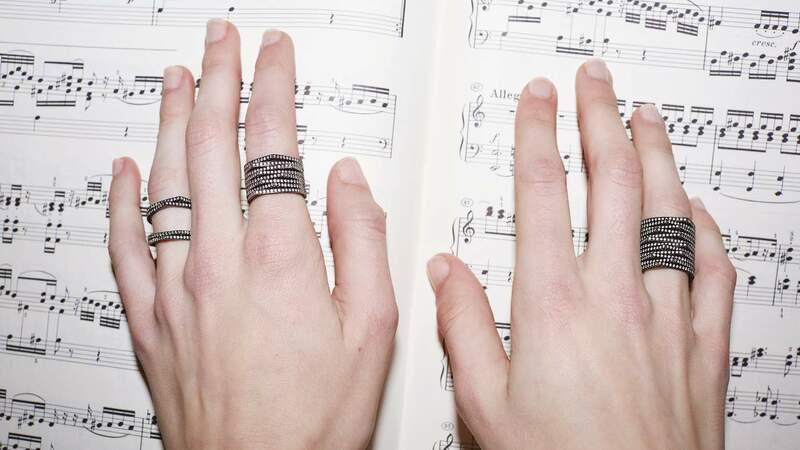 Repossi’s miniature structures are engineering puzzles, and can take time for the ateliers to perfect; the Serti sur Vide line with its rings composed of separate but connected bands, and diamond ear cuffs, took two years. Repossi says, “I have an Italian atelier who say to me, ‘Miss Repossi, every time it’s a new technique.’” Some ateliers panic, some love the challenge. The secret of Repossi’s success is in balancing this artistic experimentation with adornment that compliments the wearer rather than overwhelms them. “For me what makes jewellery modern is something unusual, something a little bit unexpected but at the same time not necessarily a statement,” she says. 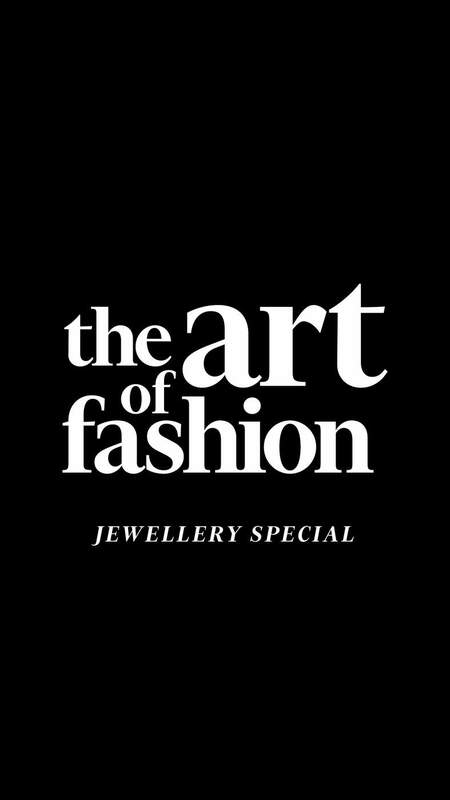 “Jewellery can have a tendency to decorate, cover and suffocate. 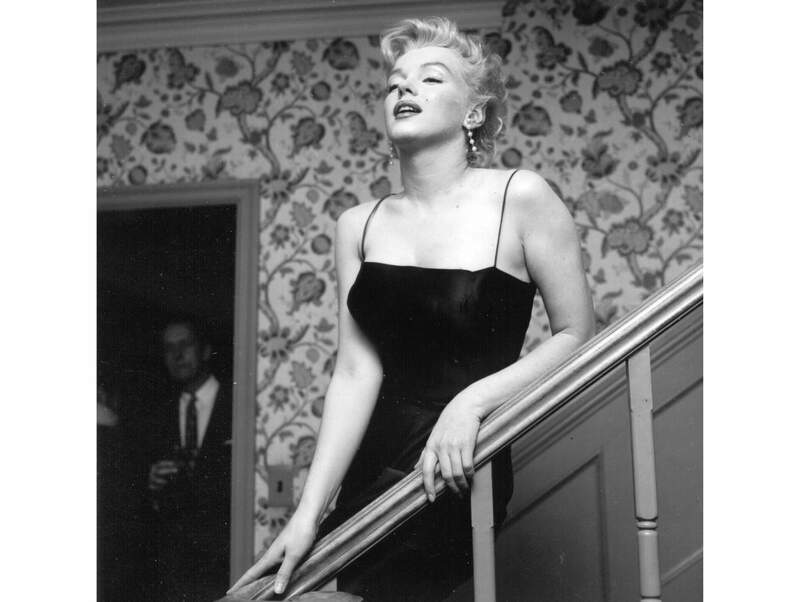 It should follow the body.” Tracing her sharp jawline with a finger laden with her slim rings, she notes that, “when we shoot an image sometimes the earring will create a certain line to complement the jaw, there are different rhythms and shapes which really work, like a prop reshaping the face.” This quality is particularly in demand with actresses on the red carpet. Isabelle Huppert, Tilda Swinton, Julia Roberts, Emma Stone and Alicia Vikander have all worn Repossi, as does the artist Cindy Sherman, who likes “the most modern pieces”. As muses go, the exotically beautiful, effortlessly elegant Joséphine de Beauharnais, Napoleon’s first and most famous Empress, hasn’t been given her due. 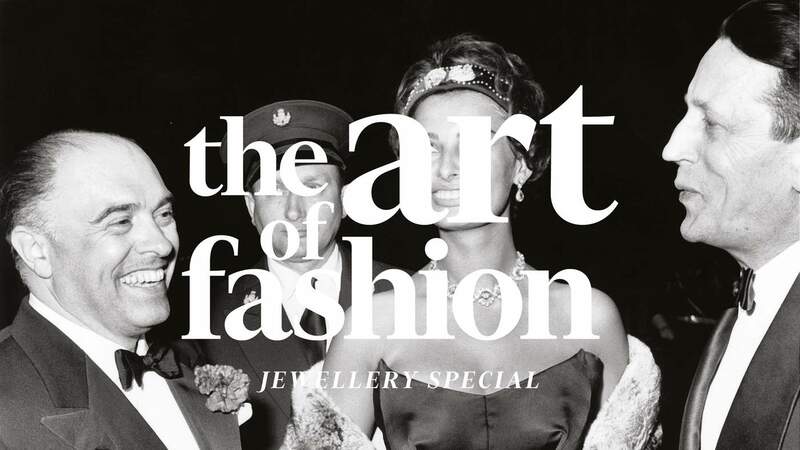 She exerted huge influence on fashion – those classically inspired, high-waisted, goddess-like gowns and low-cut, ruff-frilled necklines – but an even stronger, far more enduring influence on jewellery. 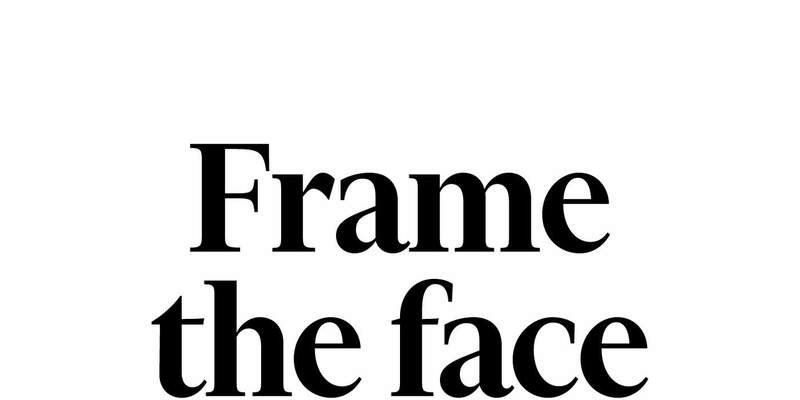 In particular the tiara. 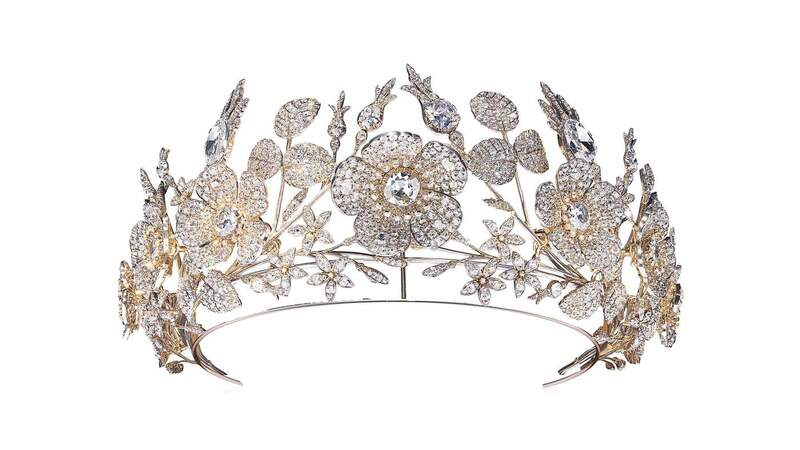 Poetic, alluring and allusive, with its echoes of golden diadems of Imperial Rome, the tiara was the jewel she made her own, turning it into the ultimate symbol of feminine power and privilege, of fairy-tale transformation for future generations. 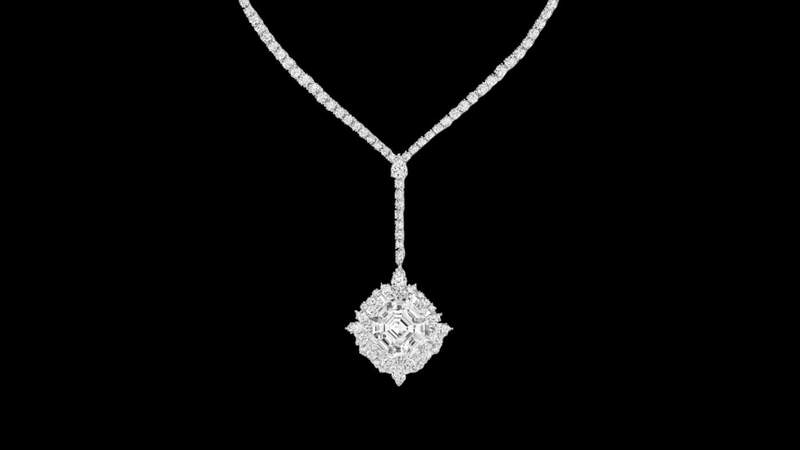 Today that influence is revived, re-evaluated and re-invigorated by Chaumet, the place Vendôme master jeweller, whose founder, Marie-Étienne Nitot, became court jeweller to Napoleon Bonaparte. Joséphine’s style and taste still drive Chaumet’s creativity, and the tiara remains the heart and soul of its story; a story now told in an exhibition, Imperial Splendours, in the Palace Museum, Beijing (formerly the Forbidden City) through some 300 jewels, objects and artworks charting Chaumet’s course from its own imperial roots in 1780 to the present day. 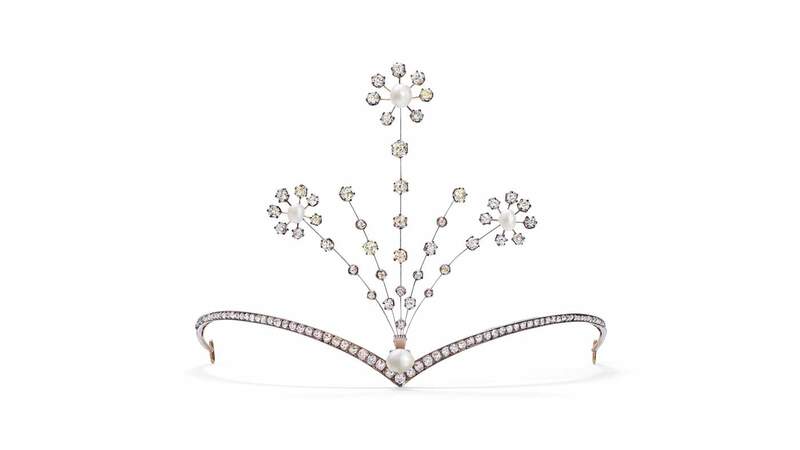 The tiara was the scintillating star of the show, punctuating each era, and brought up to date with “Vertiges”, an arresting, contemporary tiara designed by 21-year-old Scott Armstrong. 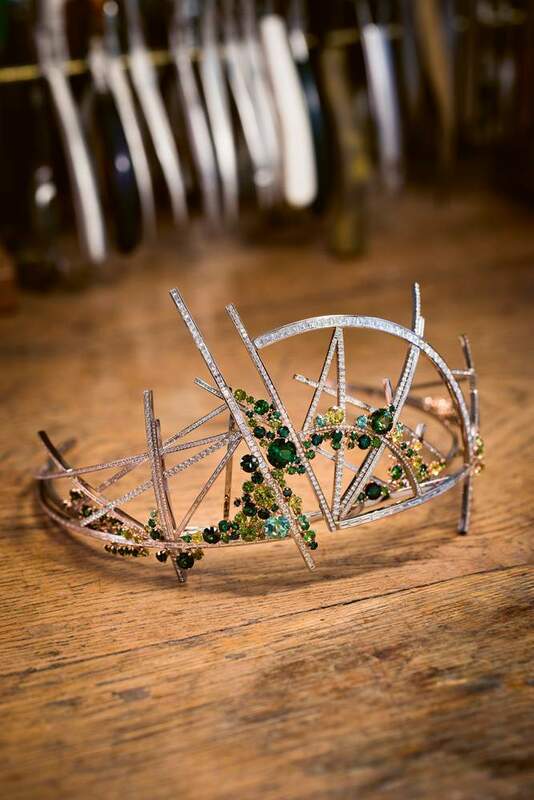 The Central Saint Martins student was the winner of a competition organised by Chaumet in collaboration with the London fashion college to create a tiara for the 21st century. 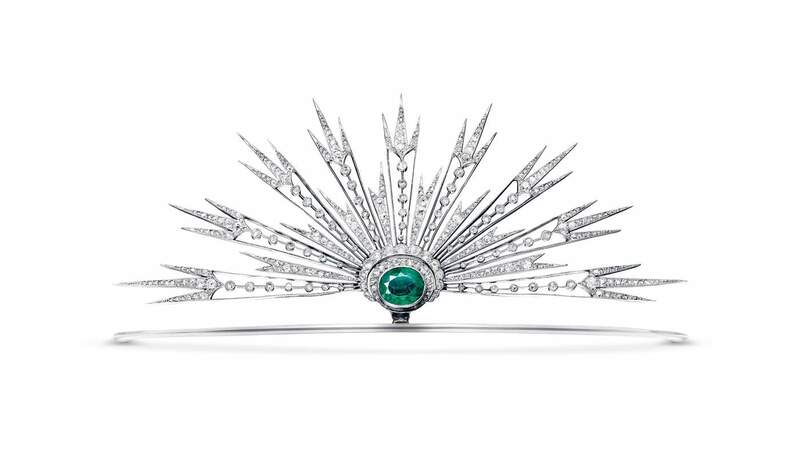 Armstrong took Chaumet’s ongoing theme of naturalism, French formal gardens and Joséphine’s mad love for horticulture as the starting point for his dynamic, architectural tiara, in which ordered, geometric diamond lines and arcs are overgrown with a chaos of clustered green tourmalines and garnets. 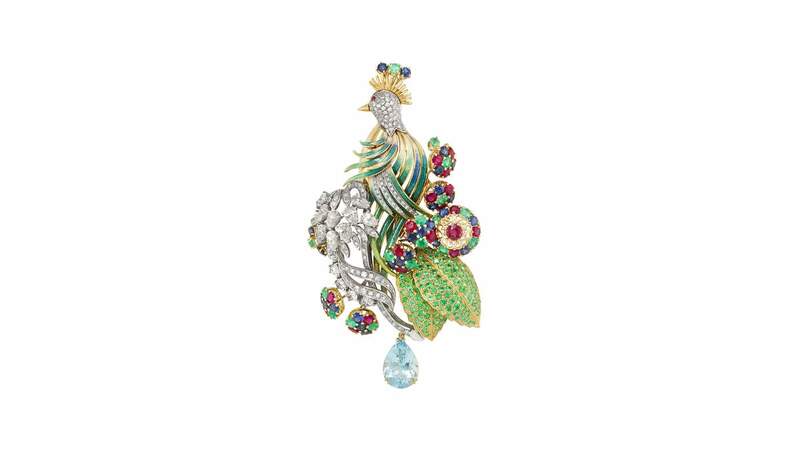 If Joséphine was mad about her gardens, her passion for jewels bordered on reckless obsession. 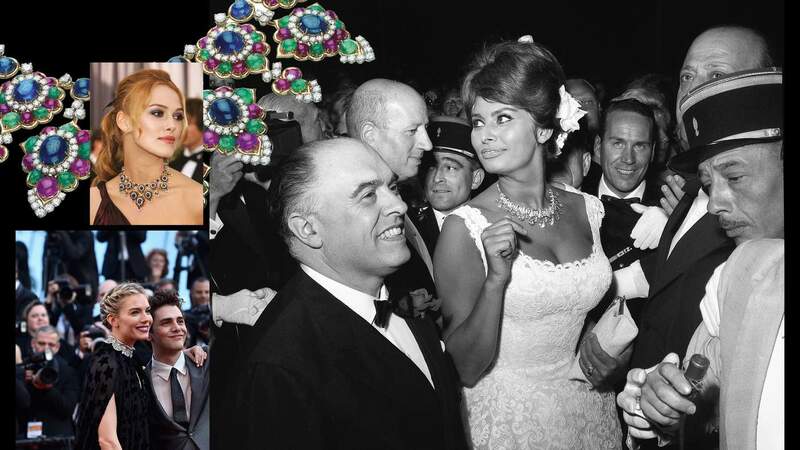 Far more than a fashion icon or trophy wife, she understood the propagandist power of fashion, finery and jewels – especially jewels – to inspire confidence, loyalty and allegiance, to convey the pomp and majesty of Imperial might. 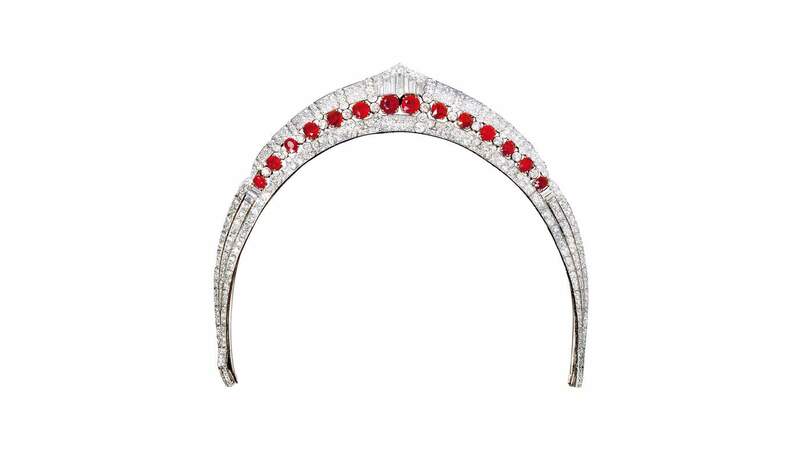 Every one of the magnificent gem-encrusted parures made for her by Nitot was crowned with at least one imposing tiara. These she wore with great panache, as seen in her many portraits, often low on the forehead, countering their classical rigour and dignity with sumptuousness and sensuality. 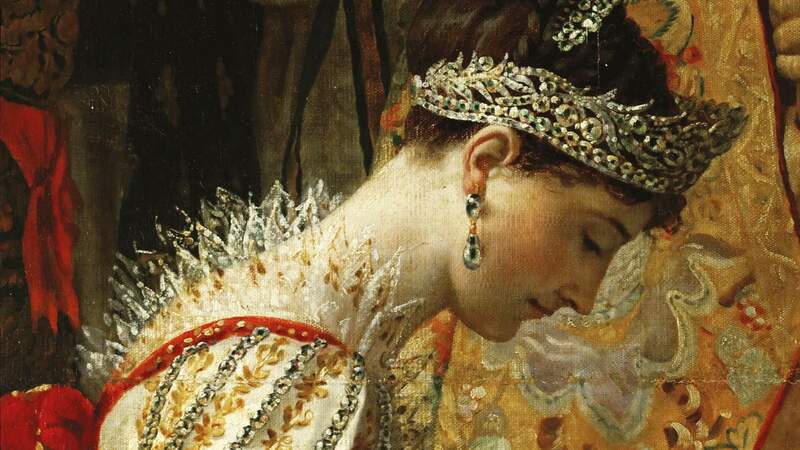 For Josephine the tiara was both a political and a style statement, she harnessed its power and re-invented its ancient, ritualistic associations for a new age, giving it a fresh fashionability and freedom of creative expression. 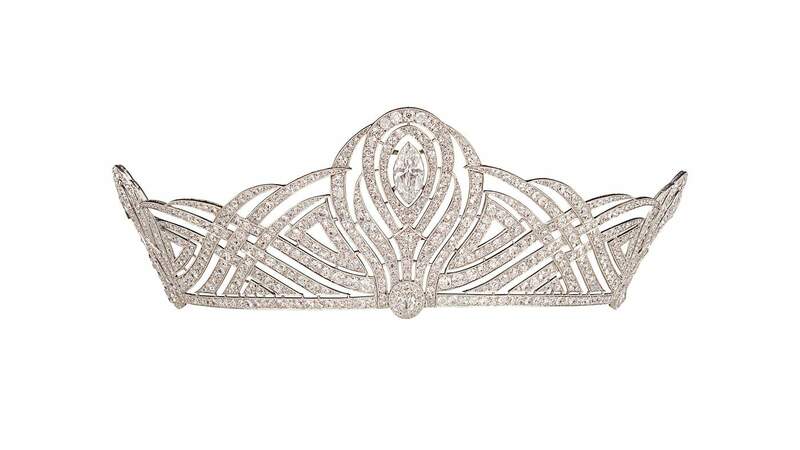 By the Belle Epoque, the tiara (now loaded with newly discovered South African diamonds) became the ultimate possession and status symbol of ladies of style and substance, their passport into society, essential wear at court, for smart dinners, soirées and the opera. 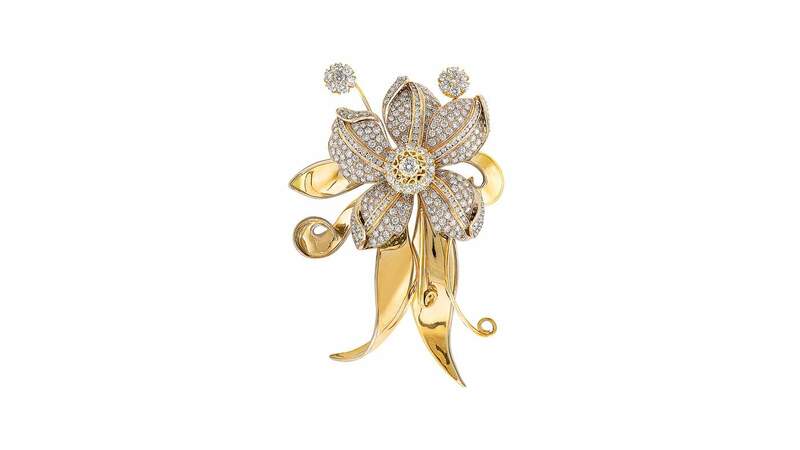 Designs were lyrical, endlessly expressive, and Chaumet was the place to go for the “It” accessory of the day. 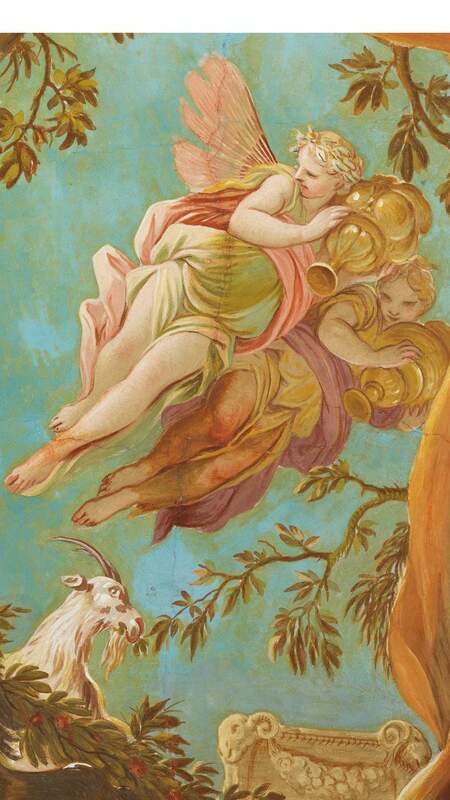 The house offered a vast choice of styles, as their design archives show, neo-classical, romantic and naturalistic. 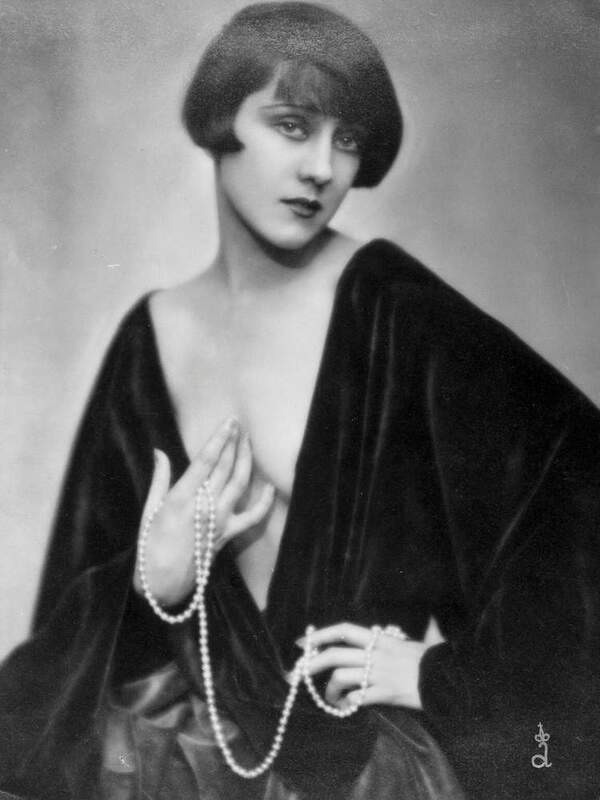 Then in the 1920s as the tiara morphed into the racy bandeau, geometric designs, in the prevailing Art Deco style, appear. The transformative beauty of the diamond tiara, the halo of light wreathing the face and head, also marked rites of passage, from American heiress into British aristocrat, from schoolgirl to debutante, and maiden into married woman – as etiquette decreed only married women could wear a tiara, a symbol of rank, status, elitism. 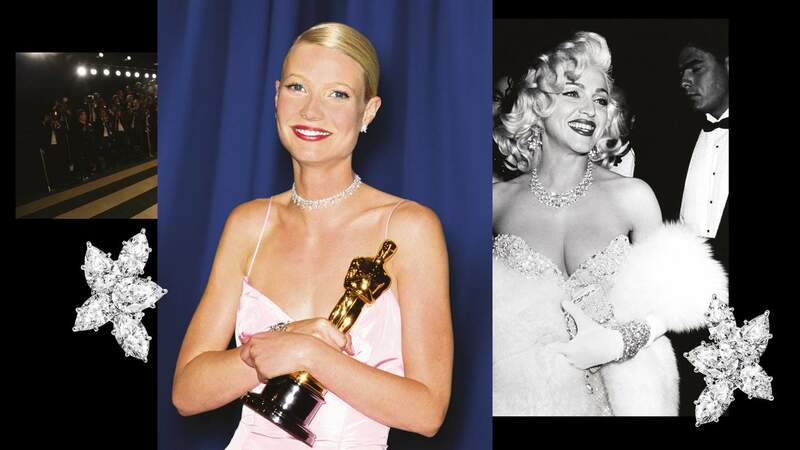 These deeply entrenched associations with wealth, power and privilege were seized on and subverted by the grunge generation, most memorably in 1995 by Courtney Love, at the Vanity Fair Oscars party. She paired her long ivory nightgown dress provocatively with a tipsy, twinkling crystal tiara, as if pulled from a dressing-up box. 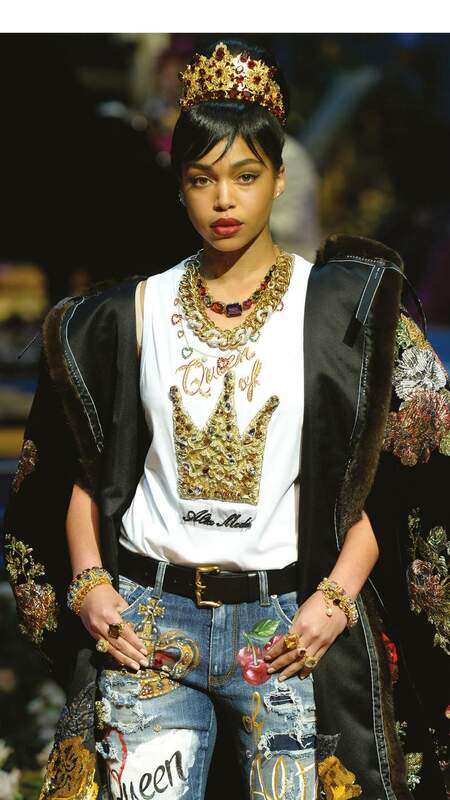 It was a way too of beckoning jewels back into fashion, with suitably grunge style shock and irony; the tiara became the cult accessory of a youth-powered fashion rebellion. In the same year, Gianni Versace won a De Beers’ Diamonds International Award for a diamond-set tiara, modelled by Madonna, the material girl, turning the social order on its head (pun intended). In 2015, as Saint Laurent reprised its seminal 1990s grunge slip dress, tiaras once again tripped down the catwalks – nostalgic, subversive, and blazing a new trail of head and hair jewels. 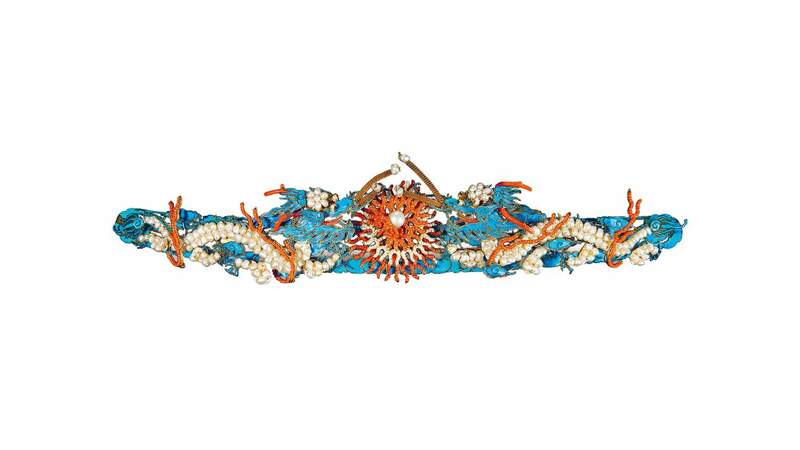 While in Asia, the jewelled tiara is now highly prized as “treasure”; an instant heirloom, a shining symbol of success. 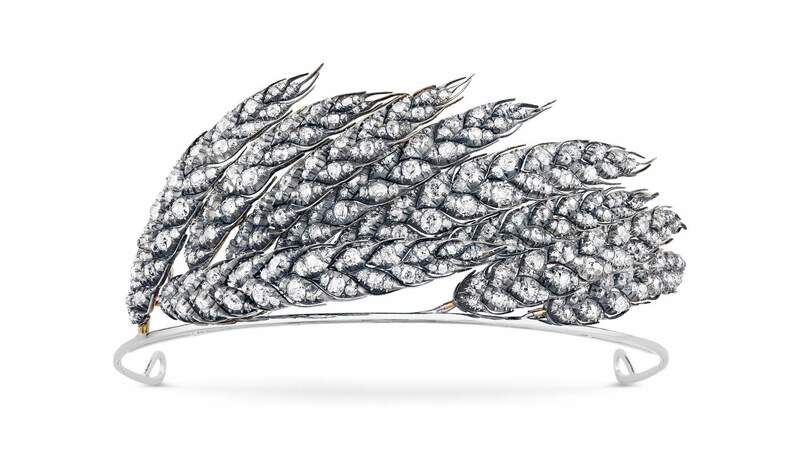 Joséphine, Chaumet’s magnificent muse, would be proud.